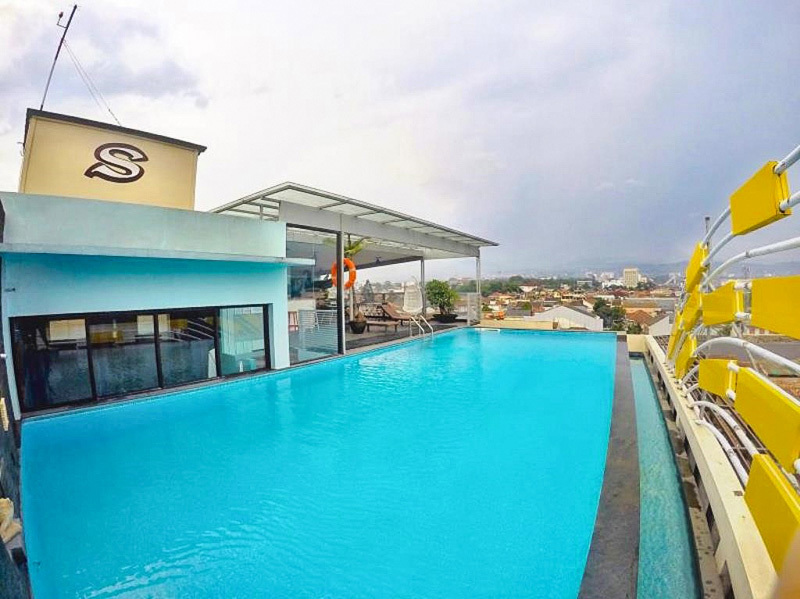 18 Affordable hotels in Bandung where you can stay comfortably during your shopping spree! 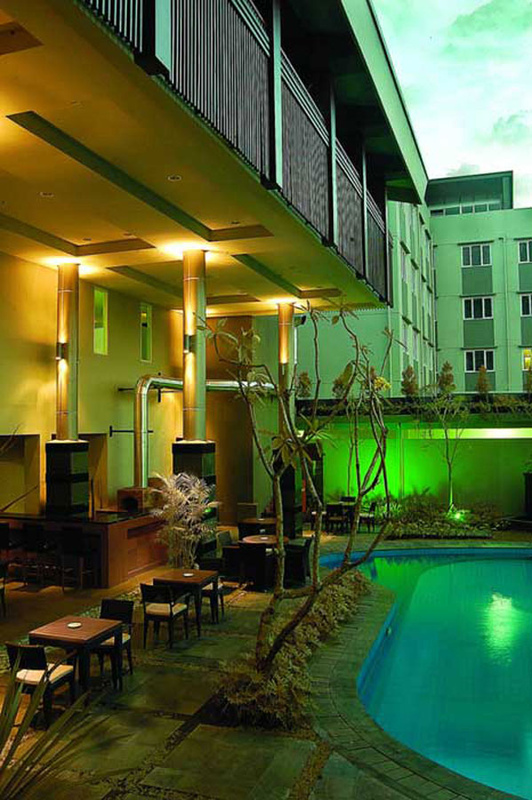 Affordable hotels are what set Bandung apart from other popular shopping destinations. Know why? You get to save on your accommodation, all the while spending on the shopping it has to offer! 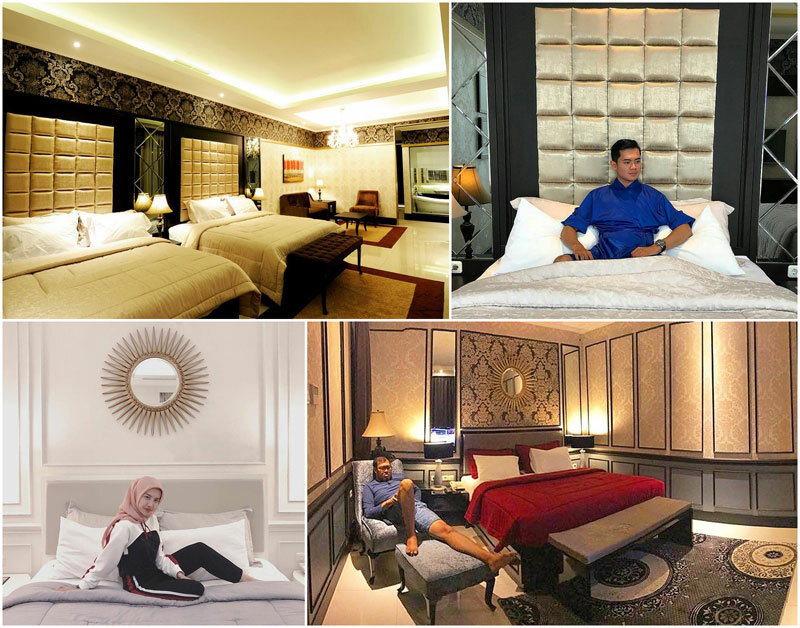 For as low as USD $18, you get to stay at a stylish hotel with all of your necessary comforts for your post-shopping snooze. 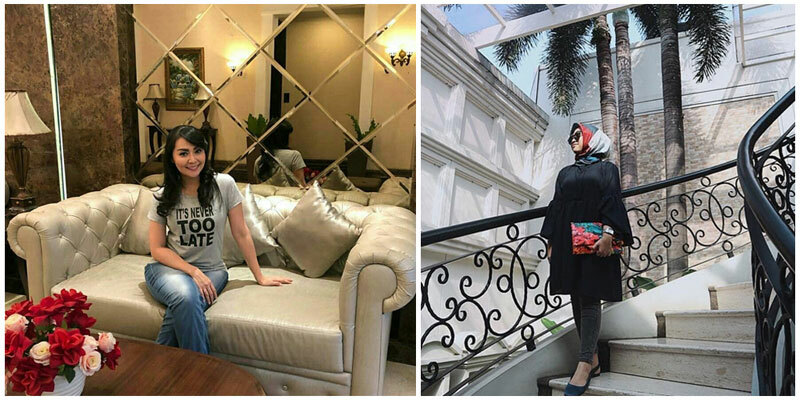 That isn’t it all, these hotels come with good looks too! 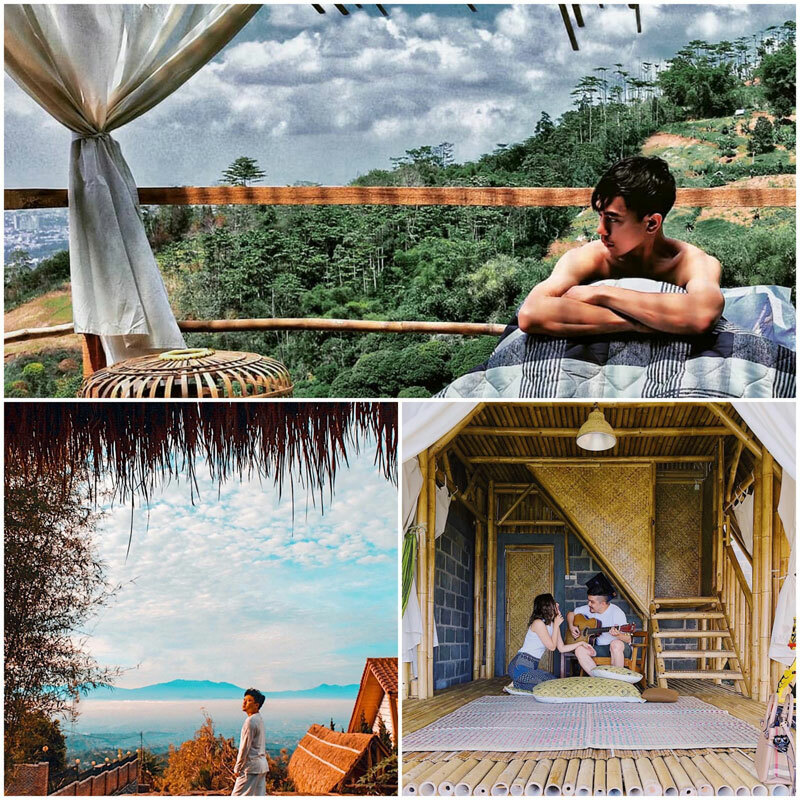 Imagine staying in a traditional Korean room, or frolicking in a resort surrounded by panoramic forest views, or how about spending a night in a minimalist yet comfortable container? 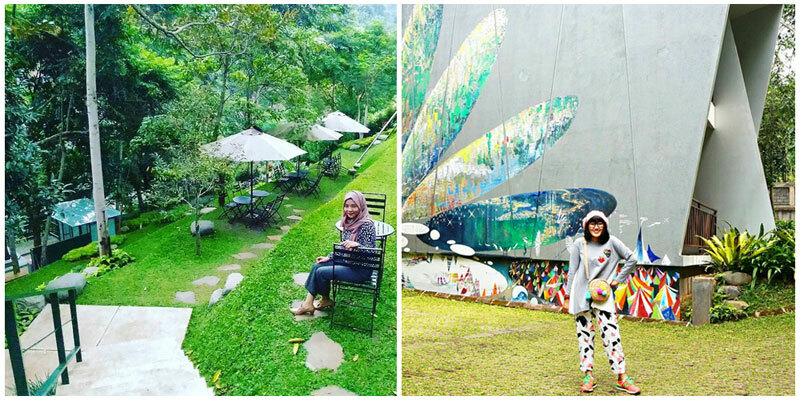 Here are affordable places to stay to add to your budget bucket list when travelling to Bandung! These value-for-money hotels help to make your dream trip come true! After all, who doesn’t love a good hotel? Especially a good affordable hotel? 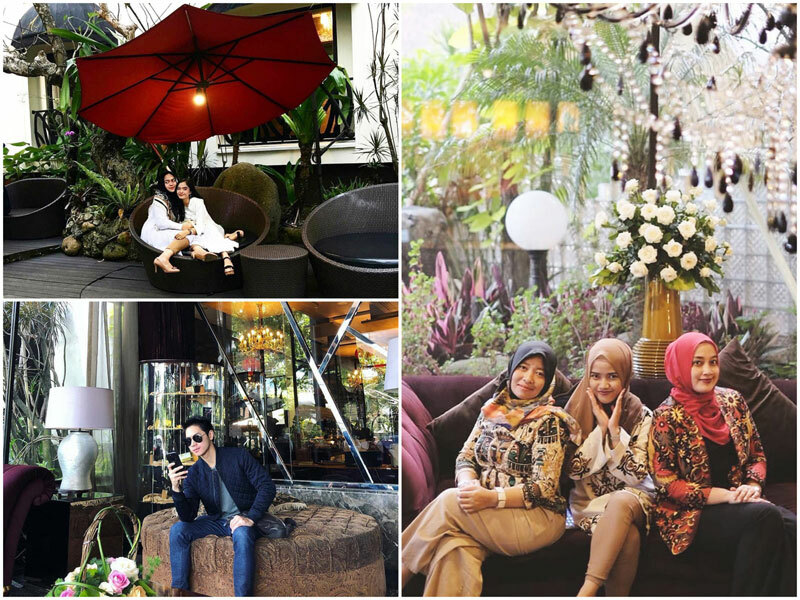 28 Best places to shop in Bandung in just 2 days! Immerse yourself in the beautiful pool, surrounded by trees and architecture that kind of reminds you of Miami, in the ’80s-fused-with-modern-oriental finishing – truly impressive! The interior is even more of a delight, with different shades of chocolate and tasteful furnishing that gives the hotel its luxurious feel. 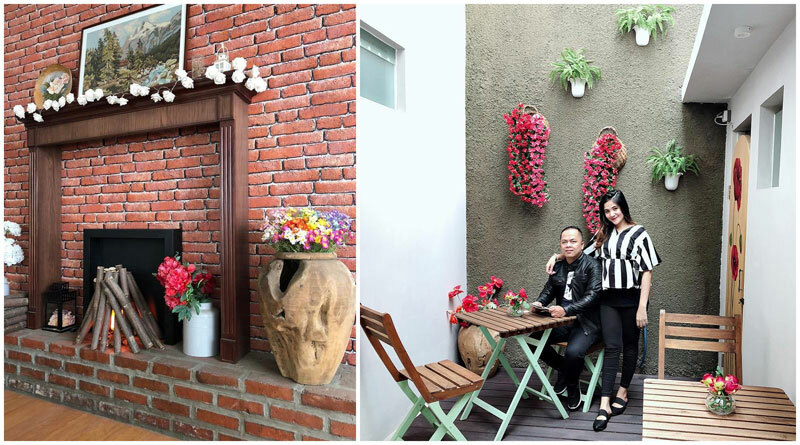 Located in the prestigious Dago area, the House Sangkuriang is only 5 km away from multiple retail chains, just far enough to keep noise away but near enough for you to drop by for some shopping anytime! There is nothing as relaxing as the sound of a flowing river with the view of paddy hills in ascending steps along the river banks. The thatched roofs are said to emit a therapeutic scent of grass when it rains, perfect for a day of staying indoors and snuggling up in bed with a book and chocolates. 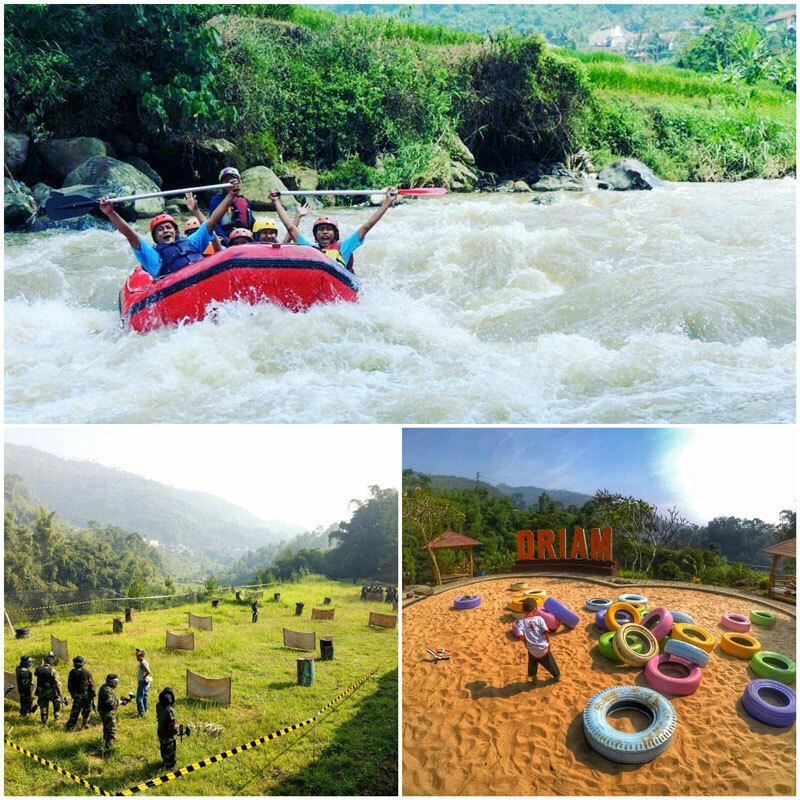 There certainly isn’t a shortage of outdoor activities guests can enjoy, from river rafting, paintball wars, ziplining through the woods, to wall climbing – a perfect place for a family getaway. 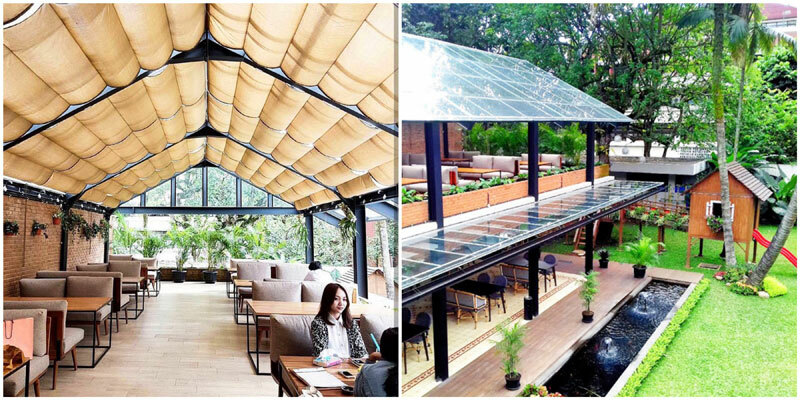 You don’t need to be a K-pop fan to appreciate this beautiful boutique hotel! 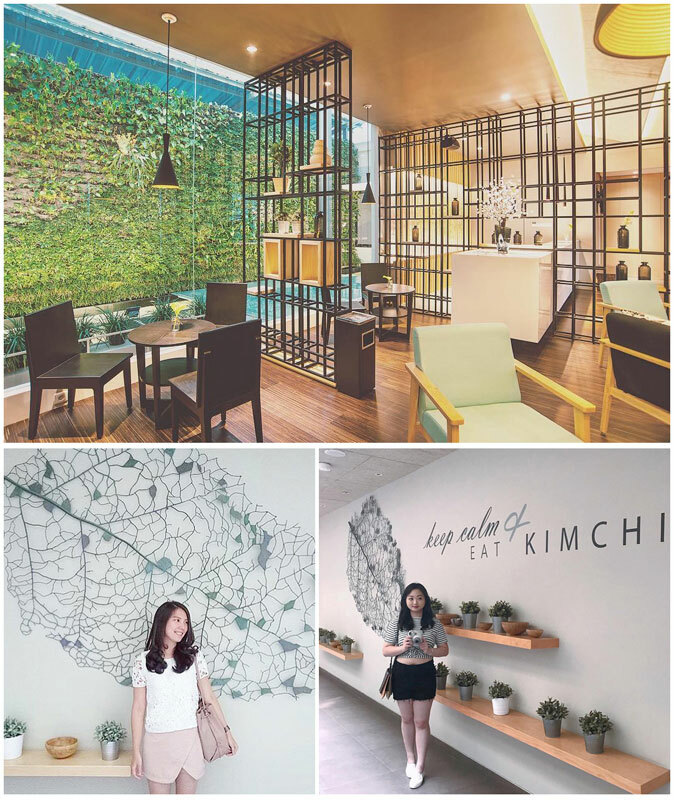 Located next to Bornga Korean Restaurant, the first and second floor of the building are dedicated to the restaurant, while your accommodation journey begins from the fifth floor where the rooftop lobby is, all the way down to the third and fourth floor where you can sleep in Korean-style rooms. 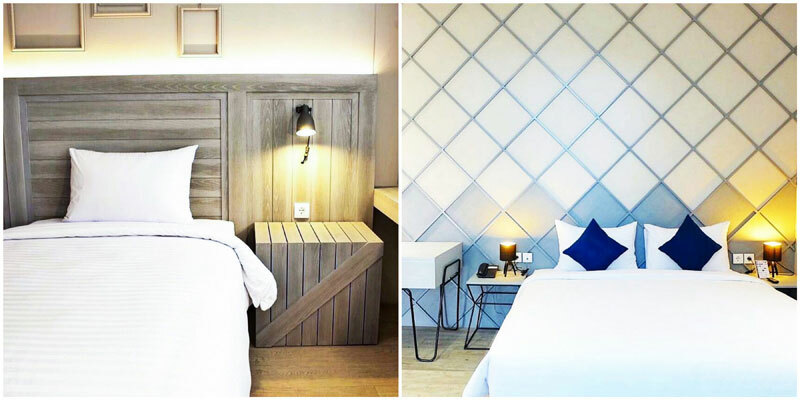 Decked in minimalistic wooden interior, the 24 rooms here are guaranteed to be super Instagrammable! 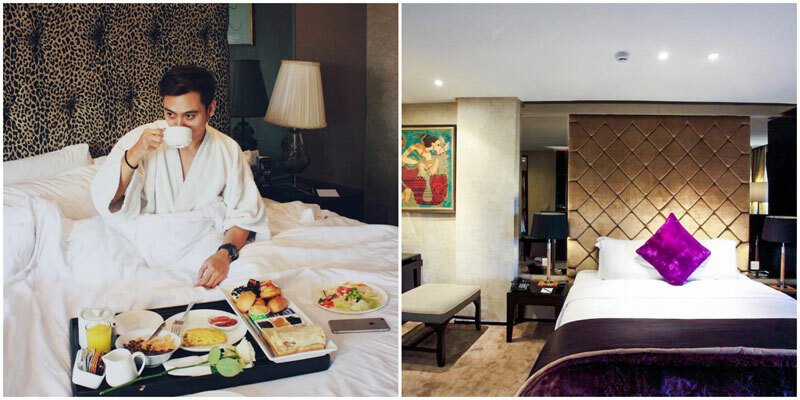 You’ll especially enjoy their in-room breakfast service. 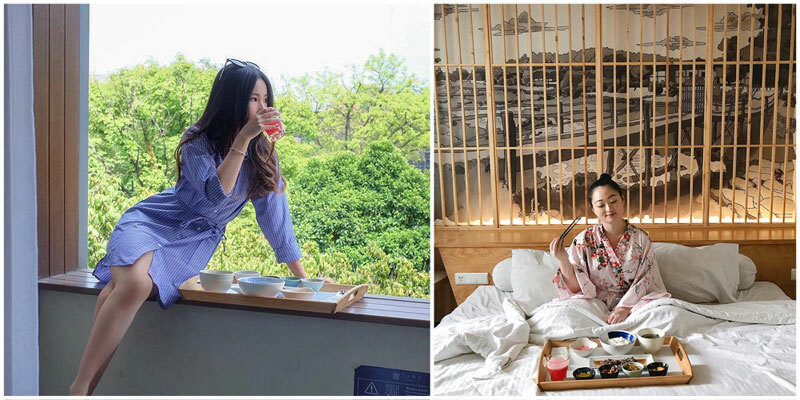 Delivered on time daily, you’ll be served a hearty Korean meal on a wooden tray, and you can have breakfast right in the comfort of your plush bed. Jinja Daebak! FOX Harris hotel speaks your language. 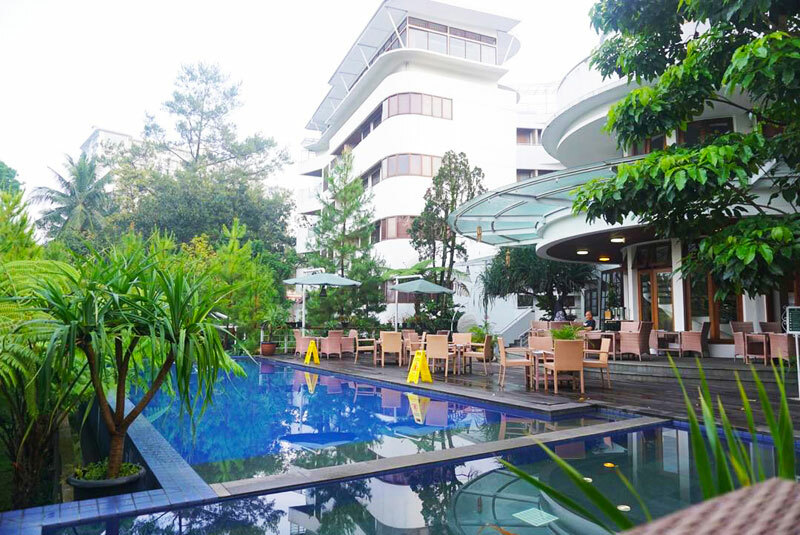 Strategically located in the city centre, this hotel is all you need for a delightful and worry-free holiday while in Bandung. Playful wall paintings with explosive colours will greet you as you step into the property. On the lobby wall, you’ll find the hotel mascot – “Mr Fox”, don’t miss on snapping a picture with him before heading to your room. 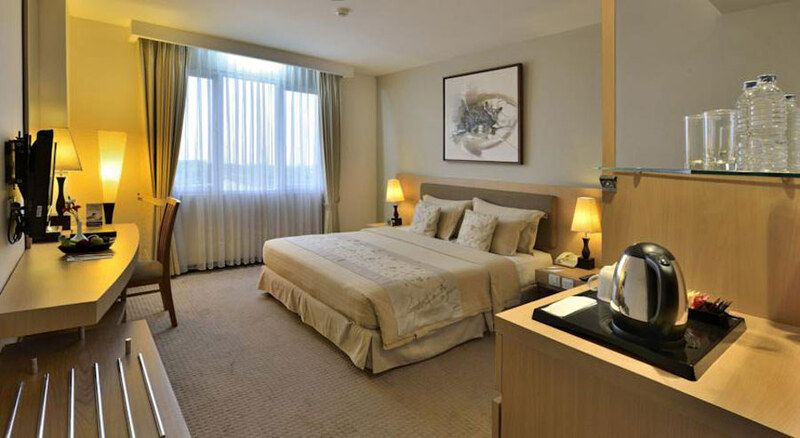 You’ll check into rooms that are spacious, sleek and comfortable – perfect to laze in after a tiring day of shopping. However, we would not recommend it for families as the hotel can get noisy at times. 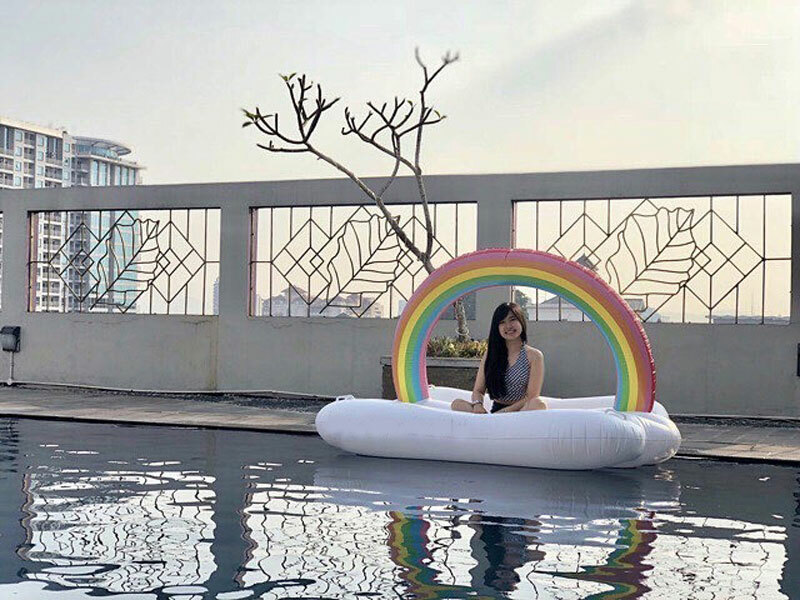 In the evening, don’t miss on heading to the rooftop pool to catch the sunset. 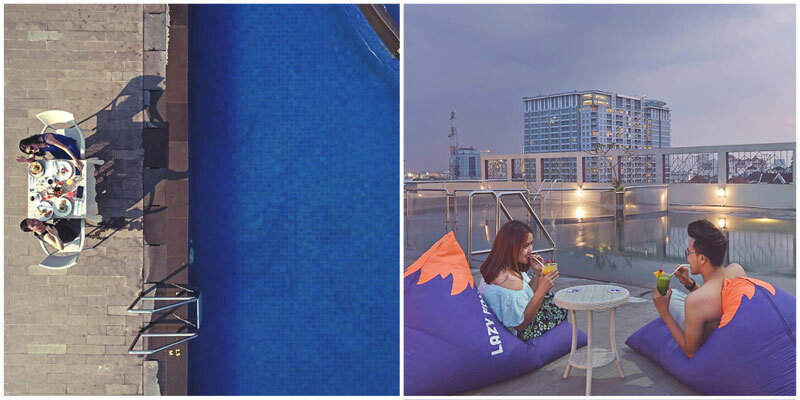 When your hands start to get pruny, lounge in one of their colourful bean bags and enjoy the gorgeous city view lying before you. 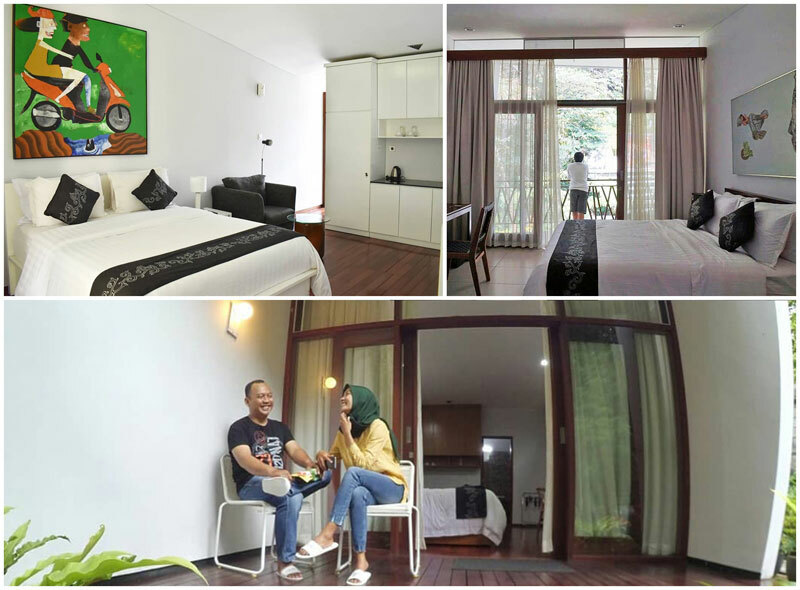 With such a stay, you’re sure to convince your partner to join your next shopping spree in Bandung! Step into the spacious lobby and you will be greeted with a green concept, clean architectural lines, and an overall open space that allows natural lighting to reach all corners. 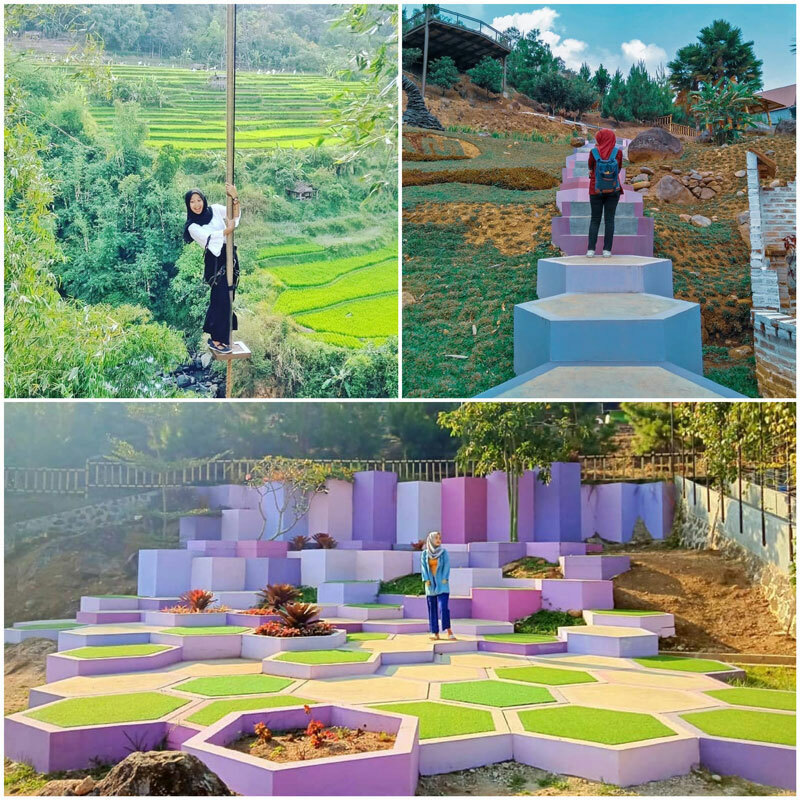 There, you’ve arrived at the Instagrammable Beehive hotel. 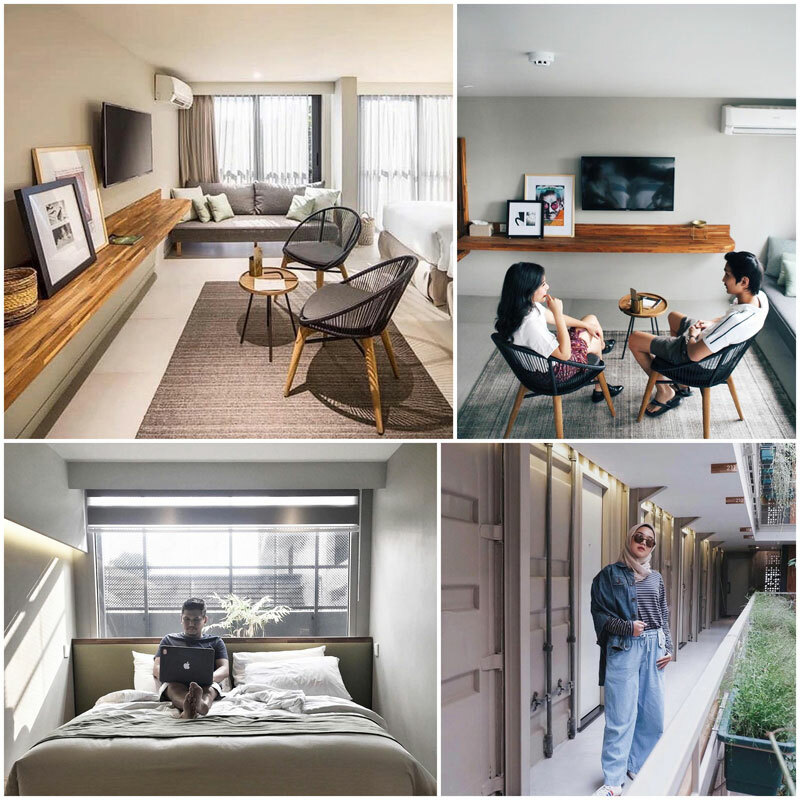 We won’t be surprised if you take a while to get to your room, because every corner of this boutique hotel is just begging to be photographed! Everything here spells understated perfection, as though you’ve stumbled upon a dreamy Scandinavian home that serves both functional and aesthetic goals in the right balance. There are a total of 5 delicious sub themes to choose from: Dusty, Olive Green, Maiden Fern, Lily of the Valley and Lily of the Nile – all with a price tag that’s well worth the comfort. 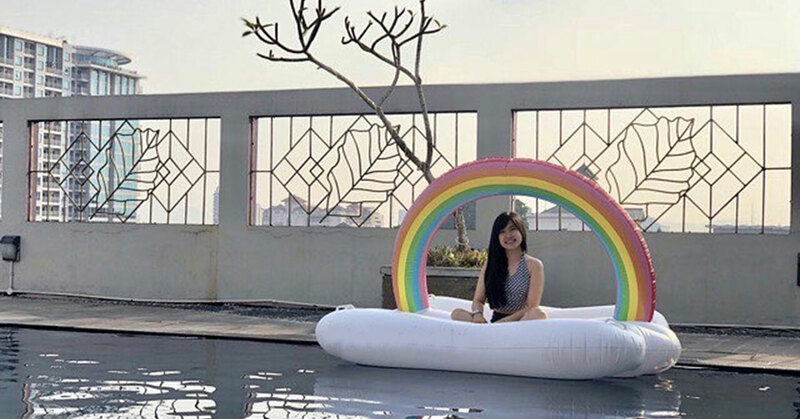 The Lily rooms are the most coveted ones with balcony access and a rooftop concept (as though you are staying in an attic room with windows in the slanted roof!). 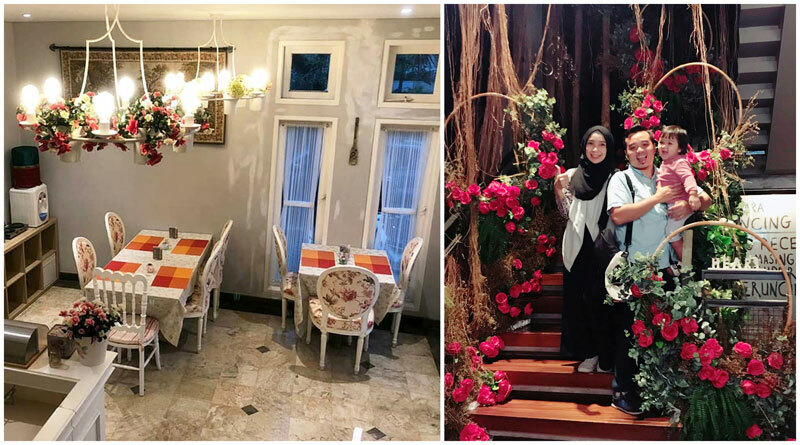 Besides its Beehive Eatery & Cafe, this pretty hotel is also connected to Kapulaga, one of the most photogenic restaurants in town with a huge garden and even a playground for kids. Love everything futuristic and innovative? Or prefer nothing but good art? 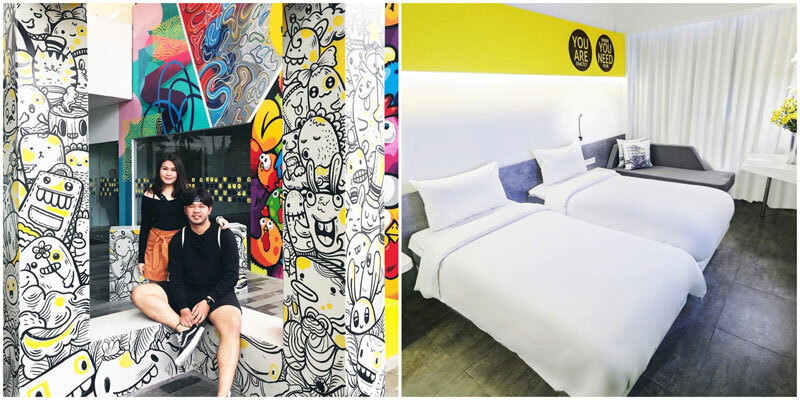 Either way, you’ll be delighted with a stay at Yello Paskal Bandung – a hub for art and tech lovers! 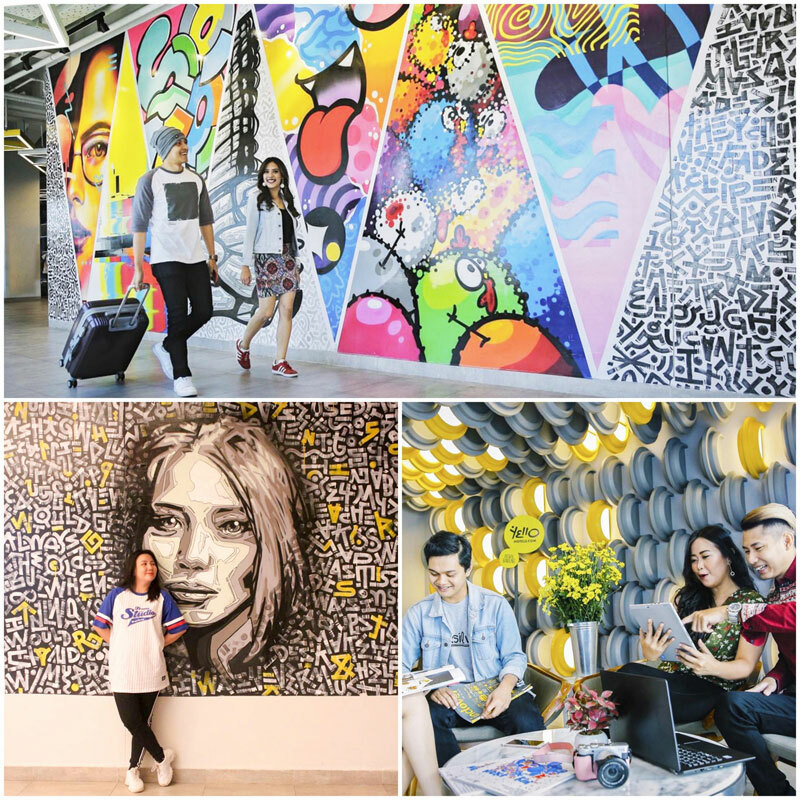 Yello Paskal gets a step ahead by combining urban art with high-technology, delivering guests superior comfort and innovation. 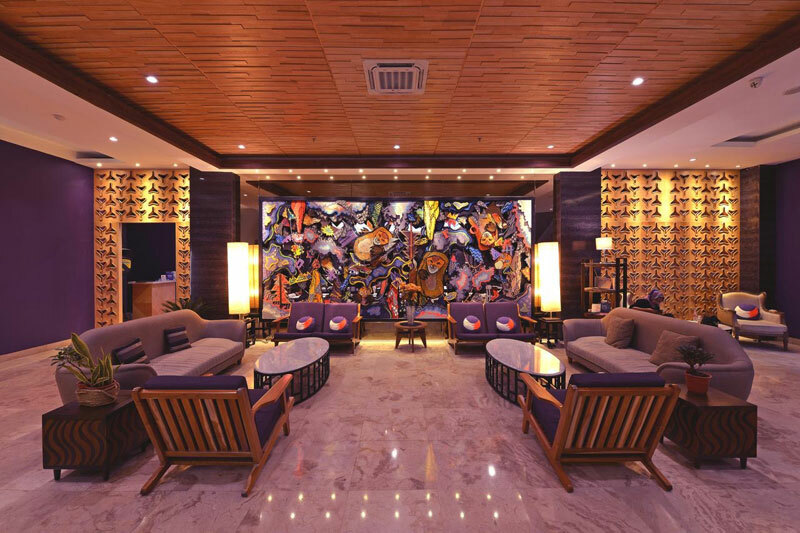 The hotel’s walls are decorated with edgy artworks painted by local and international artists while rooms come with a minimalist decor. 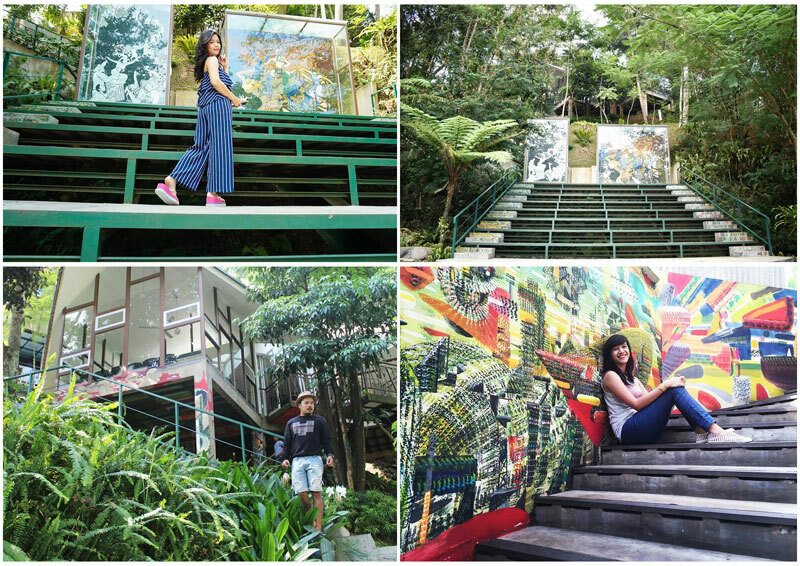 Here, you’ll find the ultimate playground to explore your creative mind! 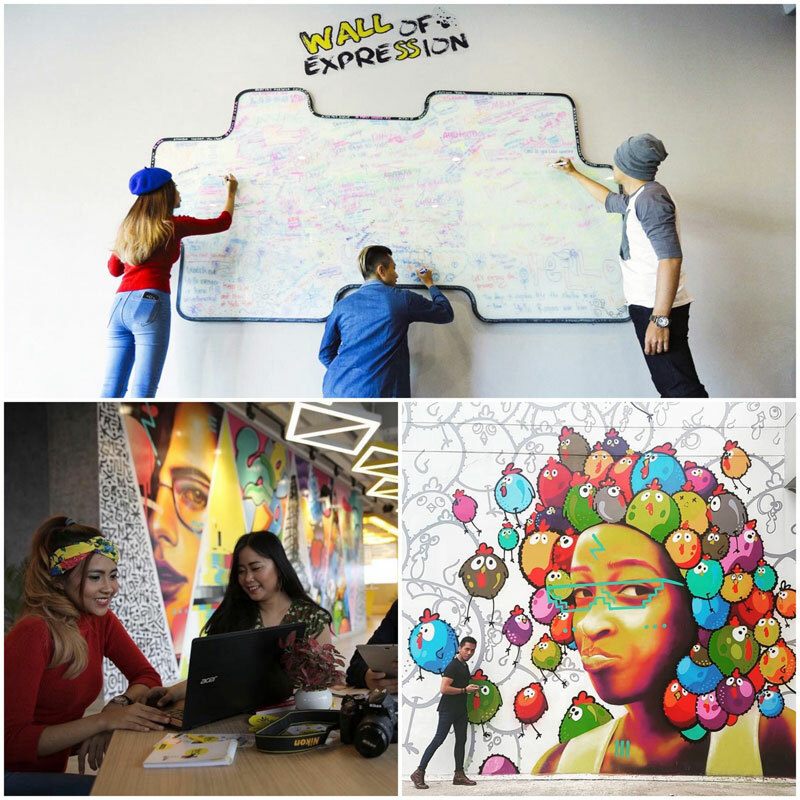 Besides comfortable rooms, you get to express your creativity at their unique art zone, stay connected with the world in their net zone and chill spot, and challenge your mates to a PES match at the gaming station! That’s one stay where you get to do more than just sleep! 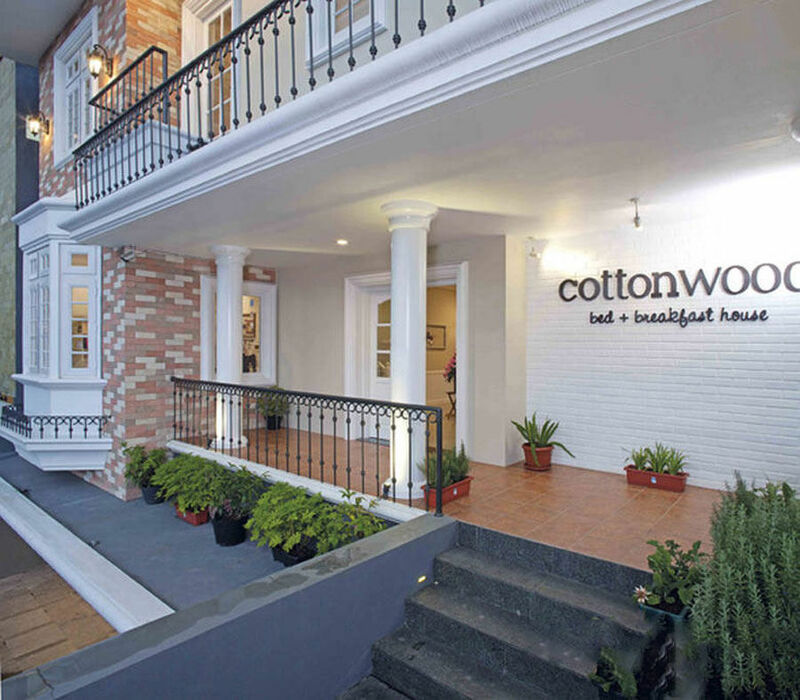 A snug accommodation in the corner of Bandung, Cottonwood B&B is located just far enough from the city centre where you can enjoy a peaceful night. 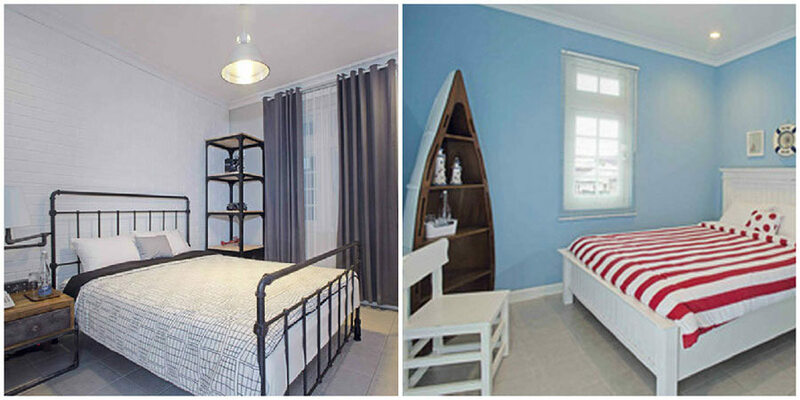 Rooms are decorated in bright pastel colours, sweet on the eyes, with Instagram-able decor. You can even purchase the trinkets placed in the accommodation! Don’t forget to check out the Cottonwood Cafe just the below the main lobby, furnished with vintage ornaments and different shades of wood. 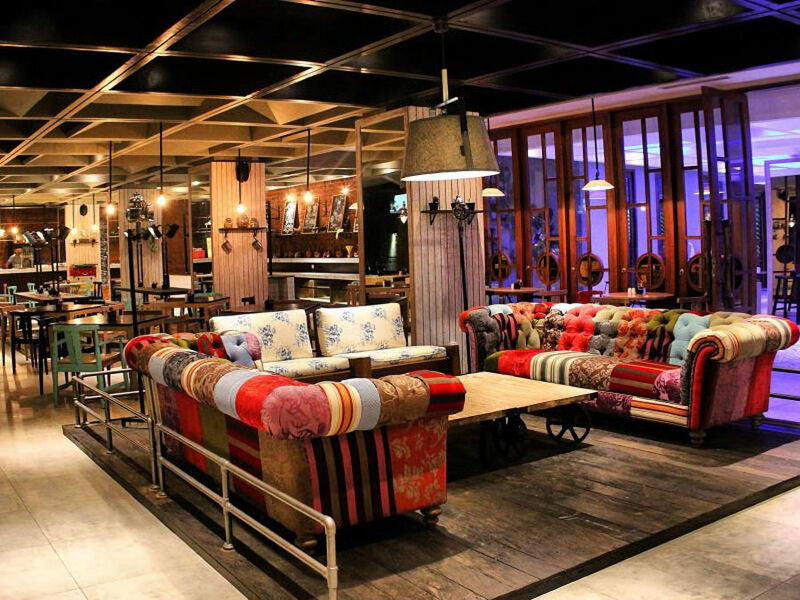 Located in the heart of the city, the trendiest cafes, restaurants and boutiques are all within walking distance. Perfect if you’re looking to shop and feast. 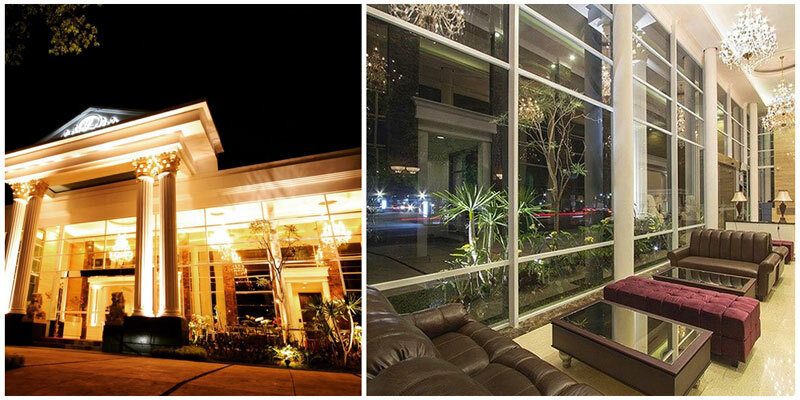 With the hotel’s chic design, both interior and exterior, it makes it impossible to take a bad photo! 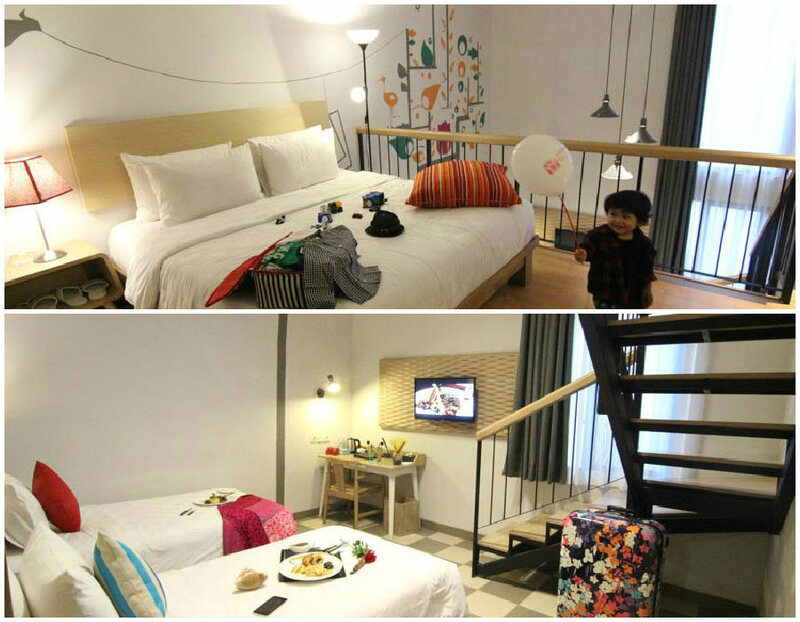 If you are bringing your family to Bandung, there are even duplex rooms for your family needs! 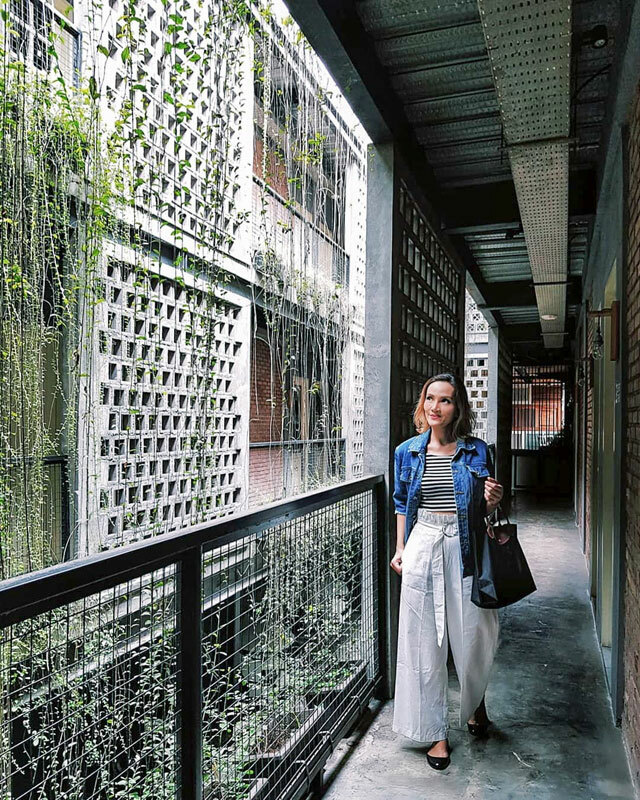 Only a few minutes’ stroll from the Grand Serela will bring you to leading factory outlets such as Rumah Mode – a very strategic location for all you shopaholics out there. The interior design is posh and classy, not what you would expect from budget hotels. 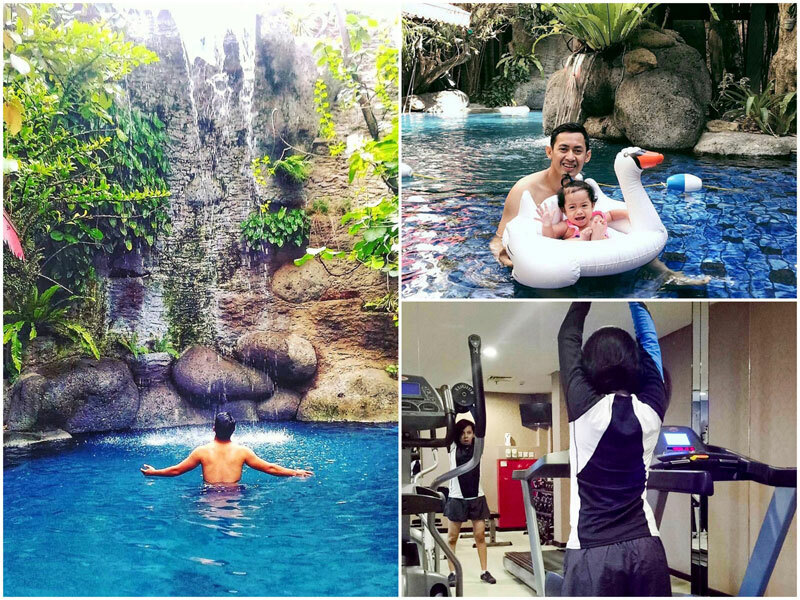 What’s more, you’ll also get to enjoy facilities such as karaoke rooms, spa, swimming pool, and a gym – everything you can ask for at a full-fledged regular hotel. Forgive the cheesy name, but this hotel is a must see! It’s not just about the pair of sheep sculptures in the lobby. 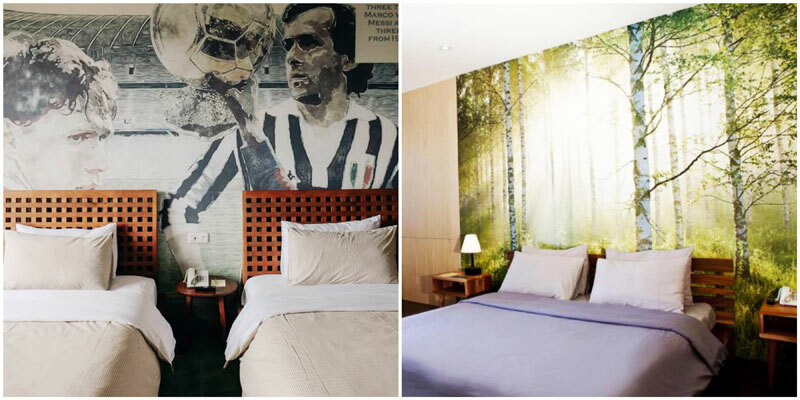 Each room is unique – brightly decorated with contemporary pop art to suit each guest’s taste. 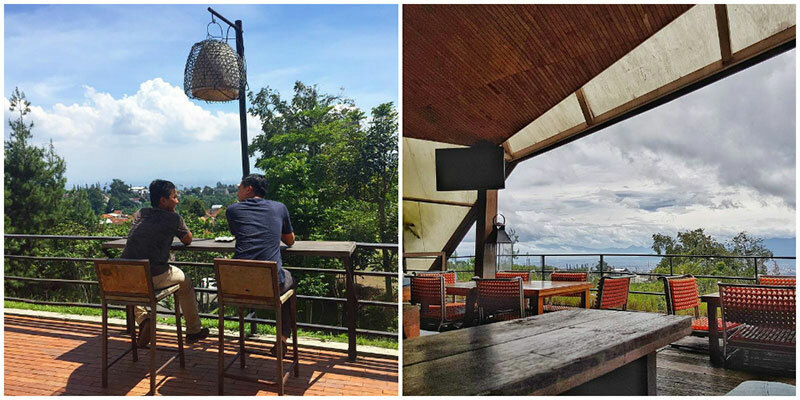 Nestled on the top of a hill, not only will you get a great view from the hotel, but you’re literally only a few minutes away from the many attractions in Bandung! 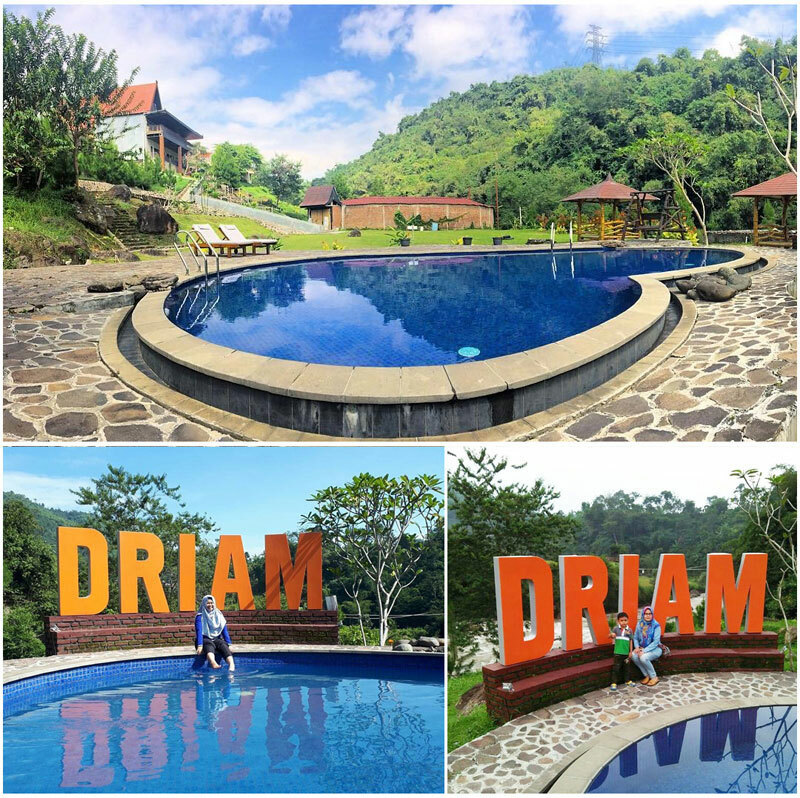 If you crave for a little adventure, the Cikole Jayagiri Resort offers camping as an alternative to staying in a typical hotel. Here’s there’s no shopping or any activity that reminds you of the city. Instead, you’ll get a chance to try out off-the-beaten trails (literally) in a vehicle of your choice! 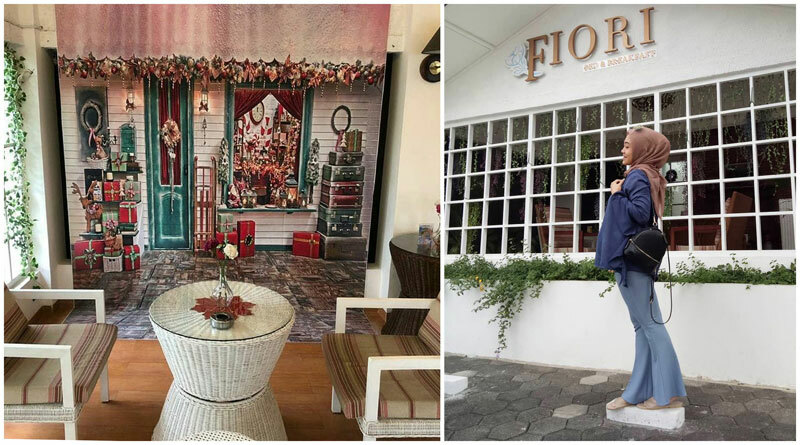 If you are one who falls in love with any gorgeous floral displays and often stop by flower shops to bring some of that magic back to your room, you’ll love a stay at Fiori Bed & Breakfast! Every corner of this establishment is gorgeously decorated with vibrant blooming flowers. Located in the relatively calm Sukajadi area, unique eateries and malls are just a few minutes away. The small yet dazzling bed-and-breakfast property offers eight types of rooms each with its own unique design. You don’t have to go outside to enjoy nature’s beauty. 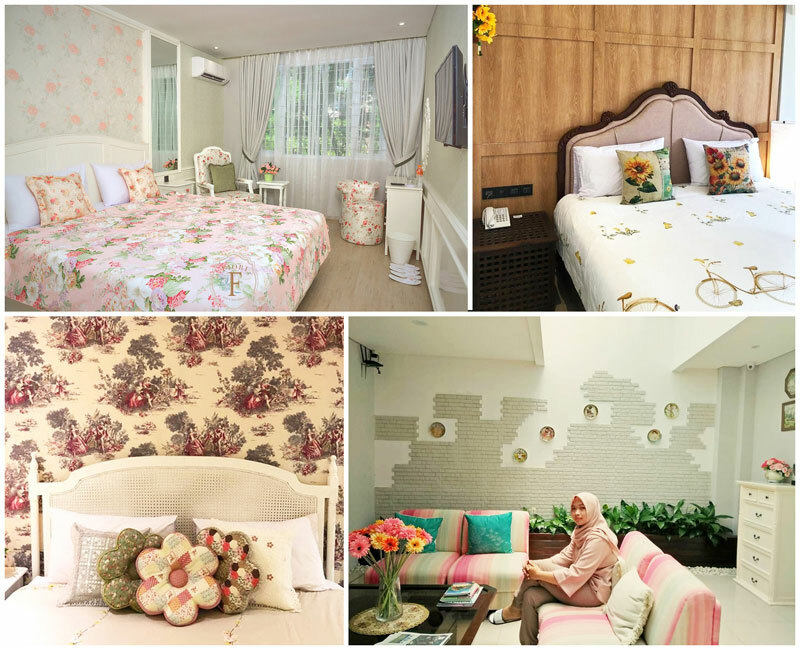 Just check into one of their rooms and enjoy opulent floral displays of roses, sunflowers, tulips and more! 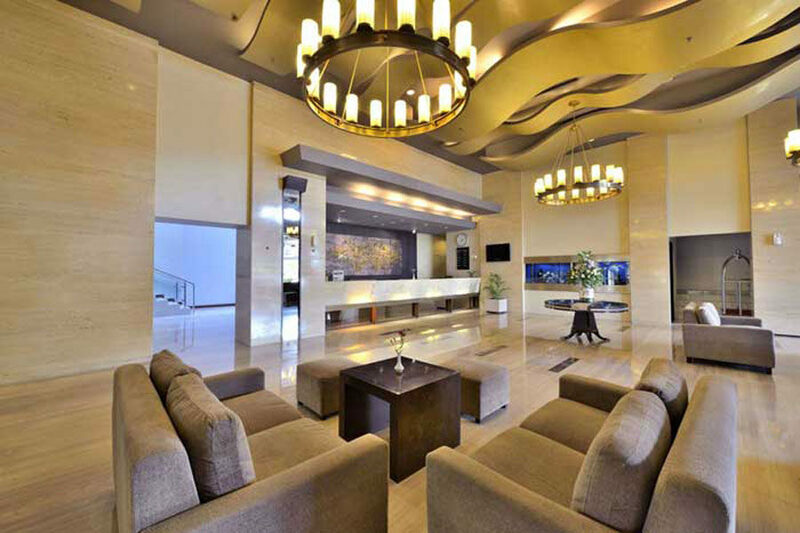 You’ll find comfort in the living room which features a fireplace and odds are good that this hotel will make you feel at home. 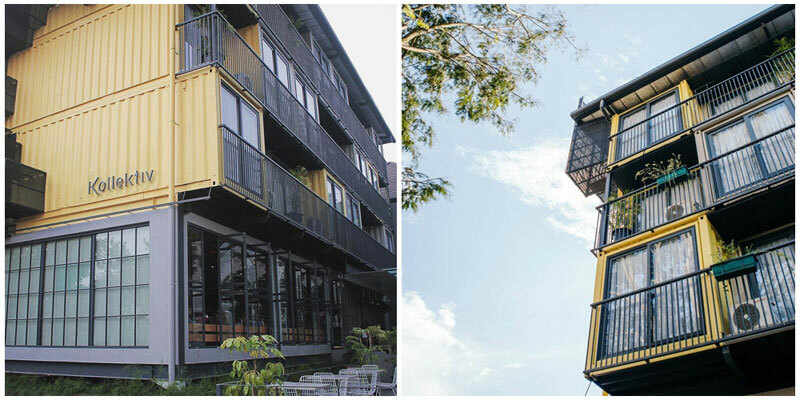 Kollektiv Hotel has proved that shipping containers can be reused and transformed into something that’s aesthetically pleasing and still functional. 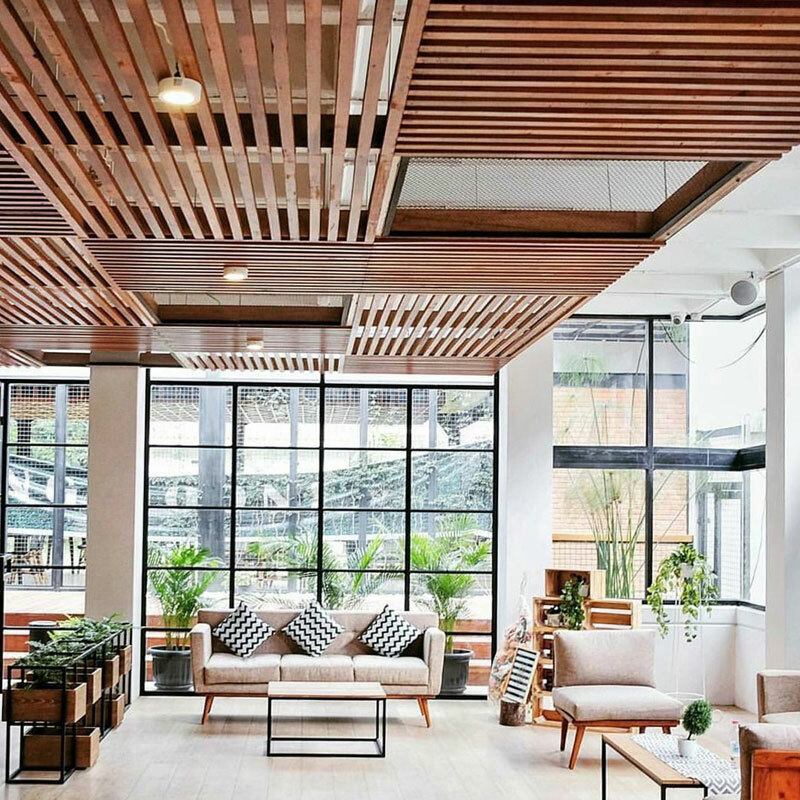 With its unique industrial theme, the hotel offers a pleasant repurposed stay with a touch of nature in its rectangular structures that have turned into livable spaces. 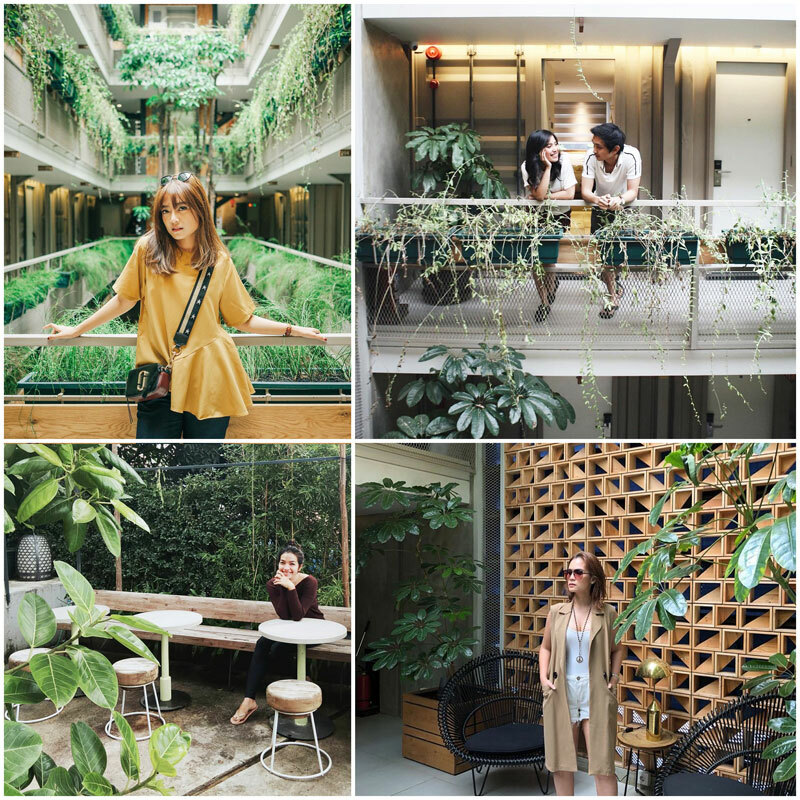 Once you step in, you’ll find yourself in a completely different environment as rows of hanging vines and several hydroponic plants bring in a unique organic touch to the plain-looking containers , turning the property into an Instagram-worthy location. 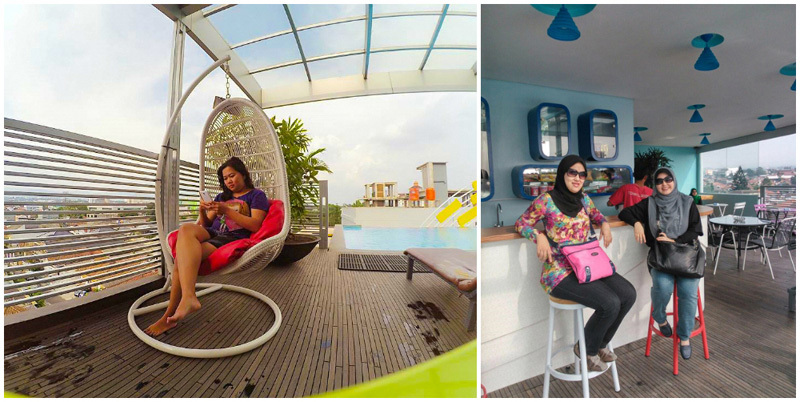 Of course, spending a night here means you get to experience staying inside a container! 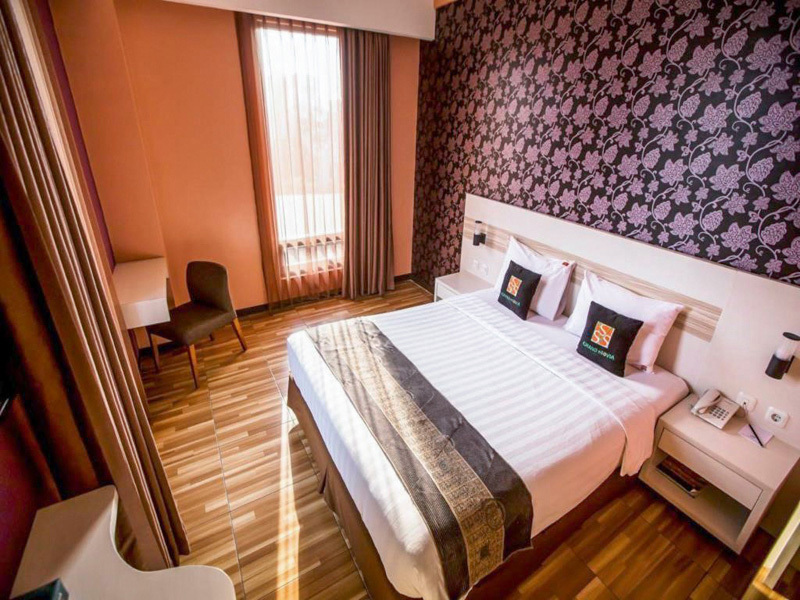 Booking a stay here comes with a cosy room equipped with a comfortable bed, bathroom, dressing table and more – all you need for a memorable stay! In need of some space? 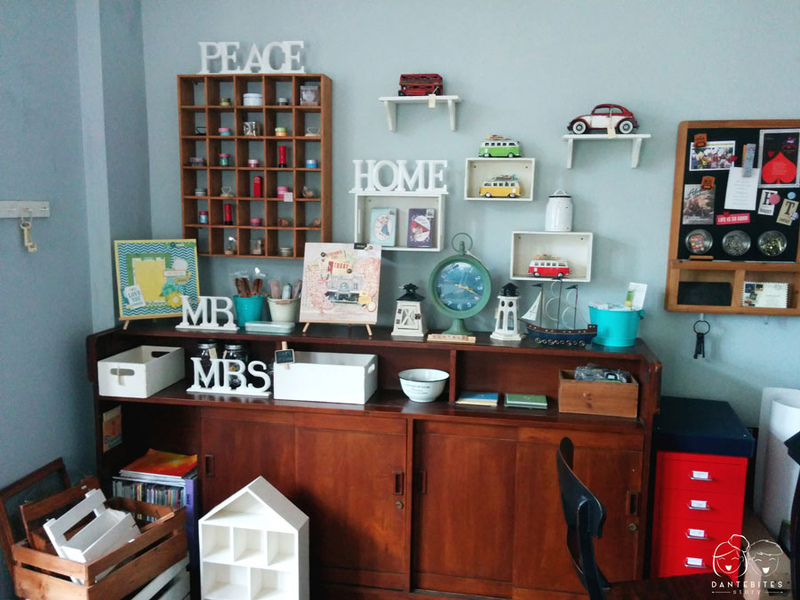 Opt for their bigger room category; one that combines two containers into one! 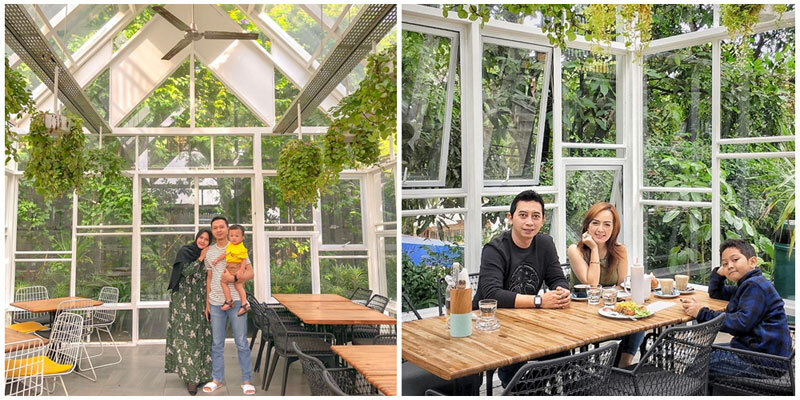 If you wish for a feast, hop over to their restaurant where you’ll find a greenhouse and a dining area all in one – a treat for both eyes and stomach. 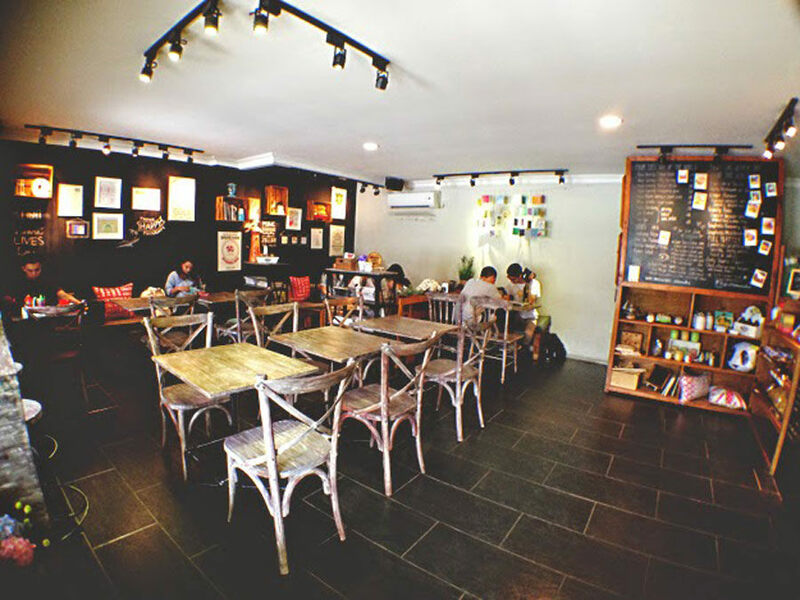 Address: Jl. Professor Insinyur Doktor Sutami, No. 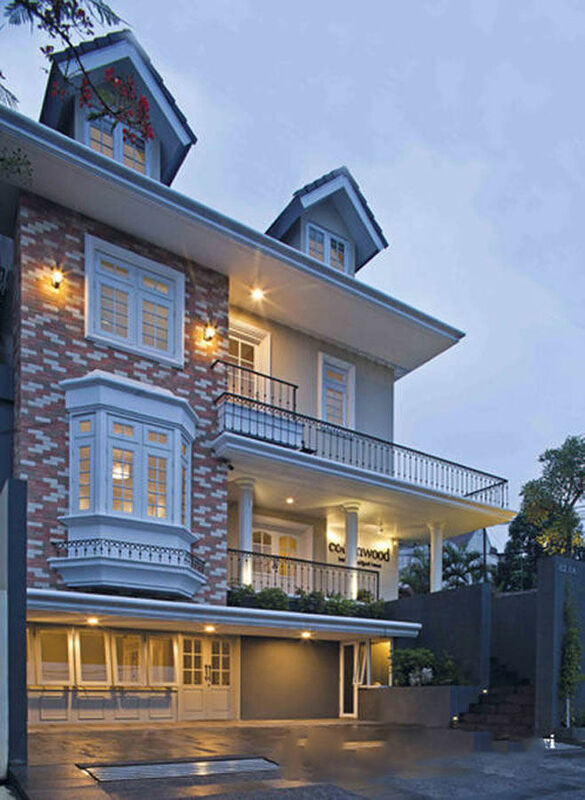 62, Sukarasa, Bandung City, West Java 40152. 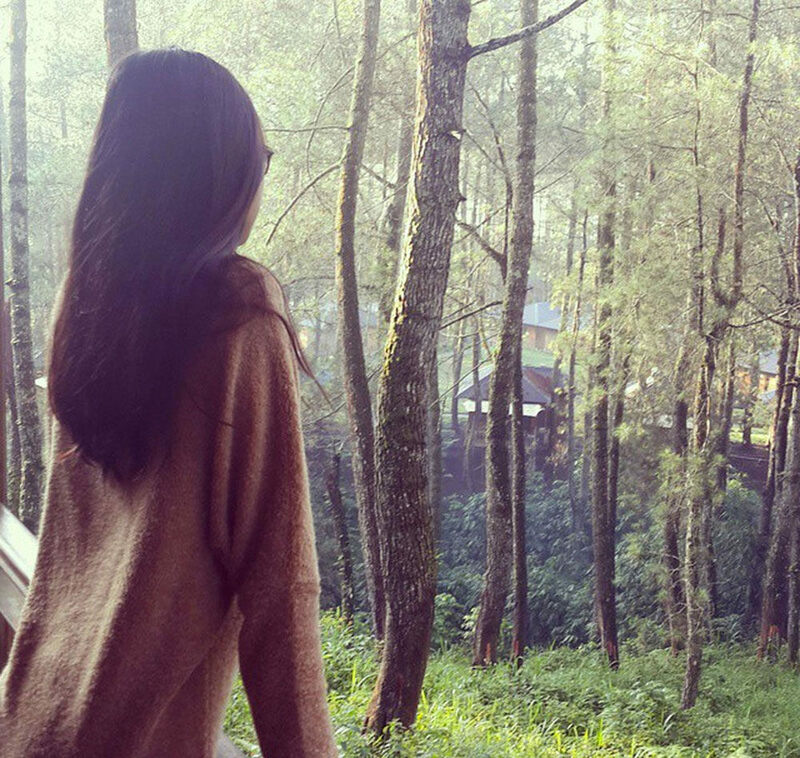 Hidden in the chilly and secluded Dago area, Villa Tel Salse is an ideal place to seek solitude and romance amidst nature. 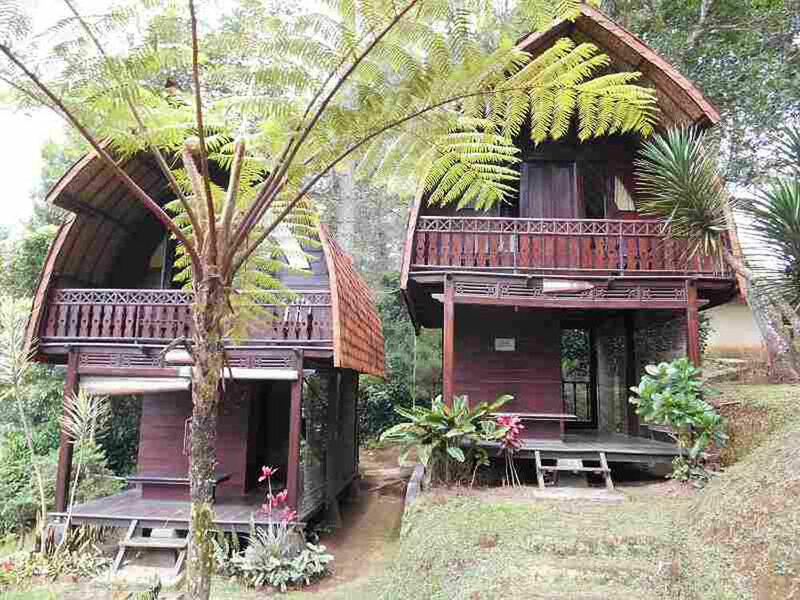 The rather small property offers a unique experience with its gallery-like ambience. In here, you’ll find a collection on contemporary artworks displayed in every corner. 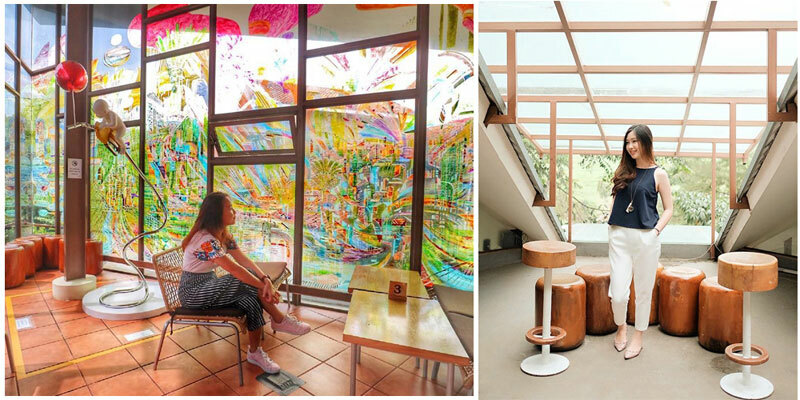 We personally love how the artistic interiors match with the surrounding natural panorama. 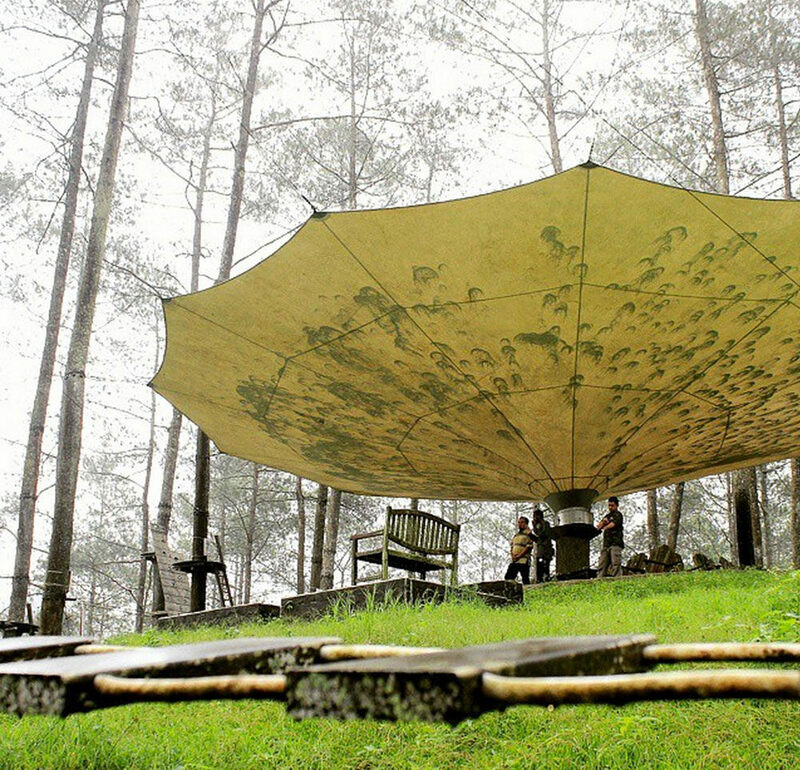 Even their mini amphitheatre is built above a clear river. 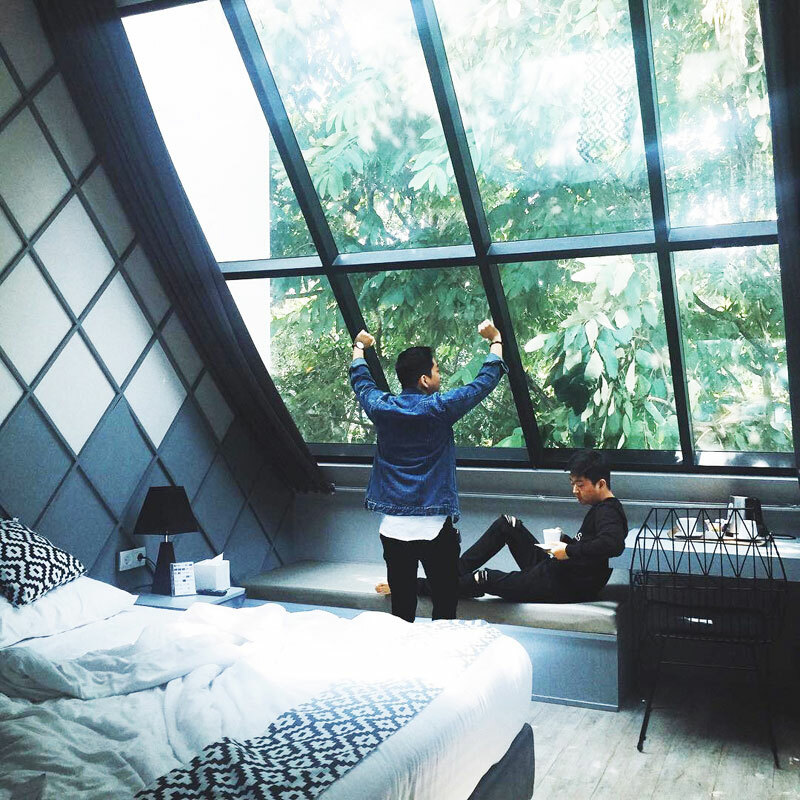 Rooms are rather ordinary but very comfortable for the little amount of time you’ll spend inside. 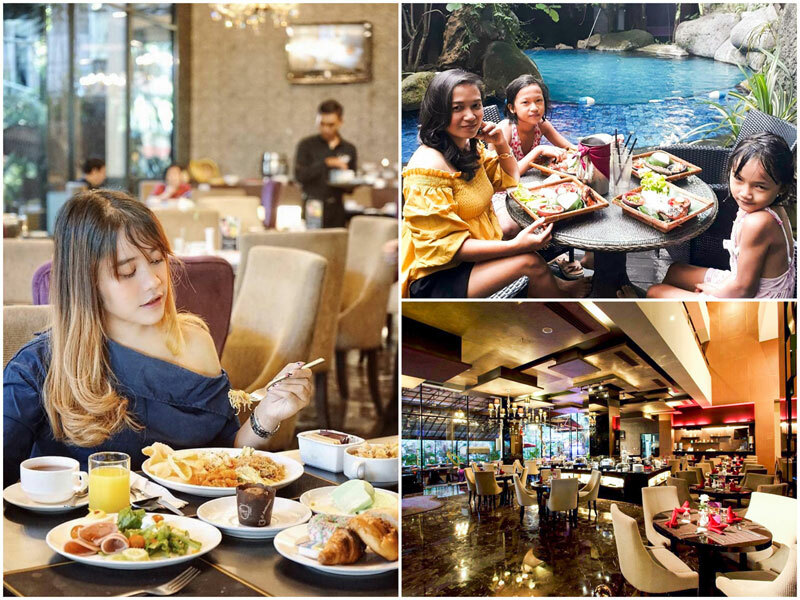 Their on-site Warung Salse happens to be a popular local eatery too and we can’t help but gush over their floor-to-ceiling windows, allowing plenty of natural lighting and fresh air to enter while you indulge in traditional delicacies! Want to experience how it feels like to live in a castle just like a king and queen do? 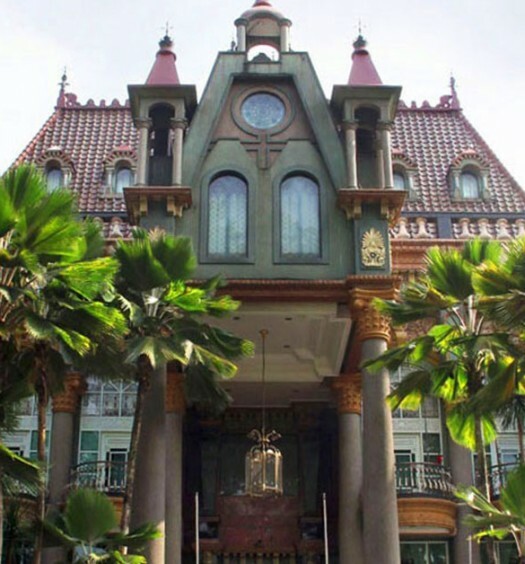 Check into Liz Palace hotel to feel like royalty on vacation as you enjoy regal romance! As soon as you enter the palace, you’ll be brought back to a classy Victorian era with their grand hall lavishly furnished with a sparkling chandelier, stunning leather sofa, and dazzling spiralling staircase. 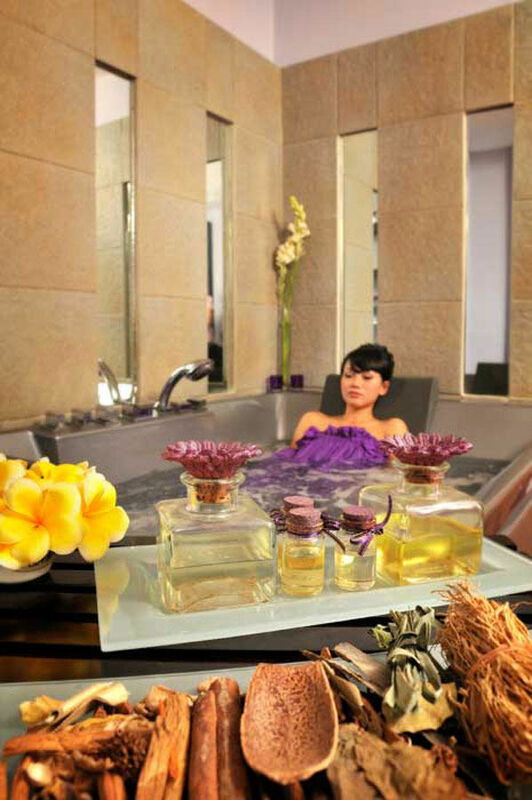 For the ultimate palace experience, we would recommend you to opt for their opulent deluxe room. 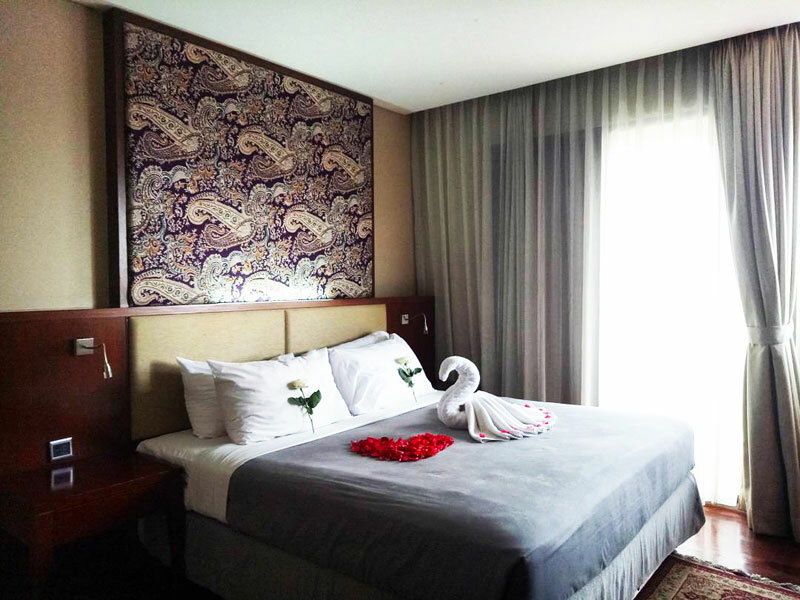 Its decor is spruced-up with gold and red tones, so you’re guaranteed with a grand stylish stay with antique vintage vibes. As if all that weren’t enough, you’ll find quality outlets offering unbeatable prices just a few minutes away from here! A hotel truly made for shopaholics! 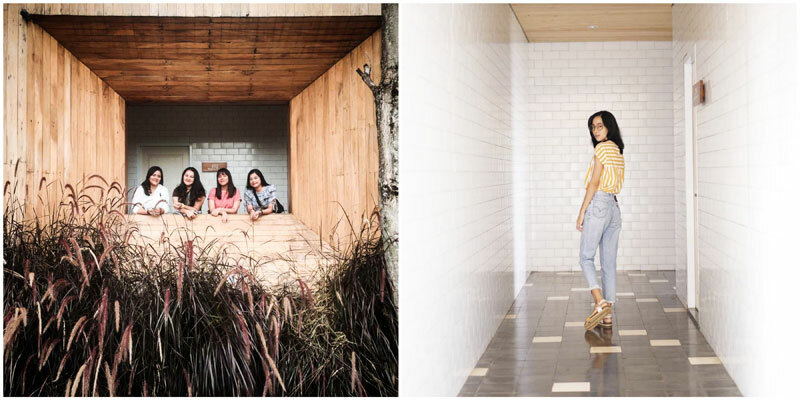 Opting for a stay at Wood Hotel means that the famed Cihampelas Walk, Dago Shopping area and Rumah Mode outlet are just 10 minutes’ drive away. 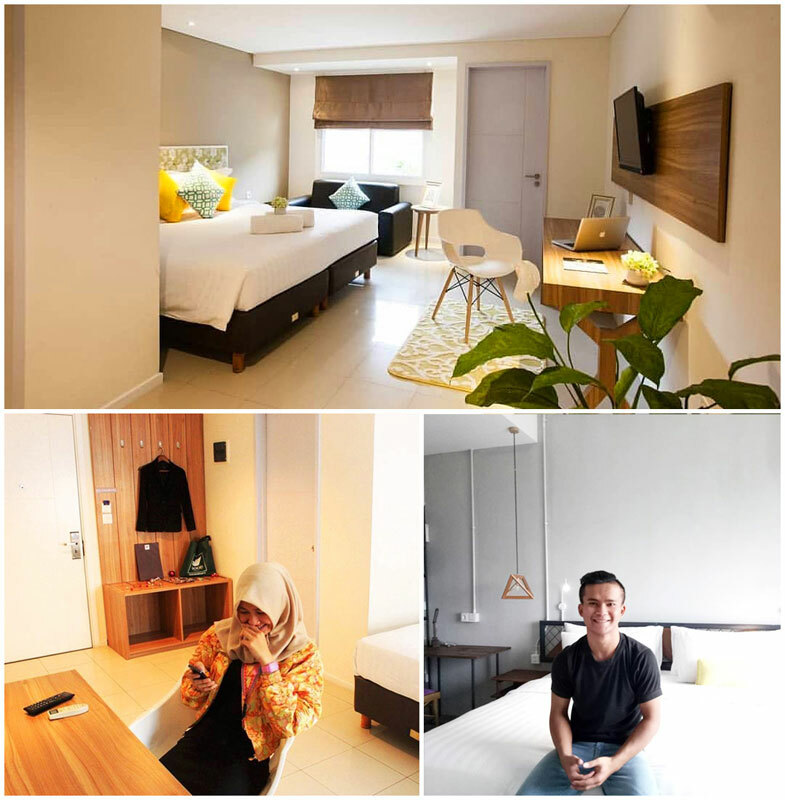 Check in at Wood Hotel and you’ll feel just like you’re home. There is nowhere you rather go after a long day of shopping. 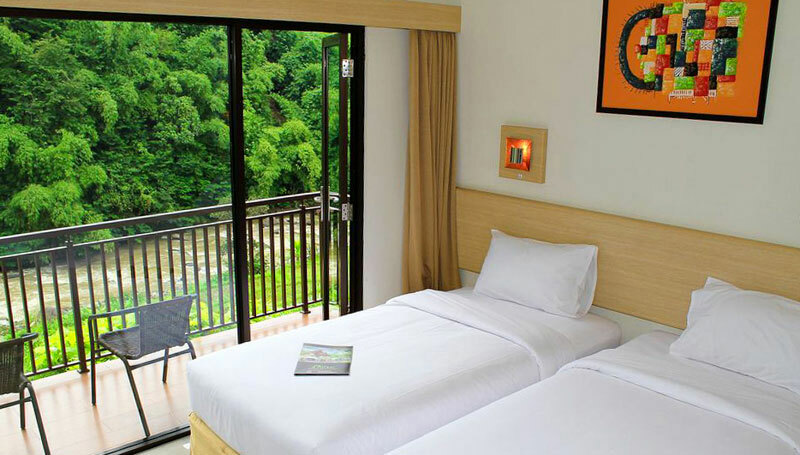 Rooms here are contemporary and very much like a cosy homestay with some categories offering a view. Of course, it is much more than just its location. 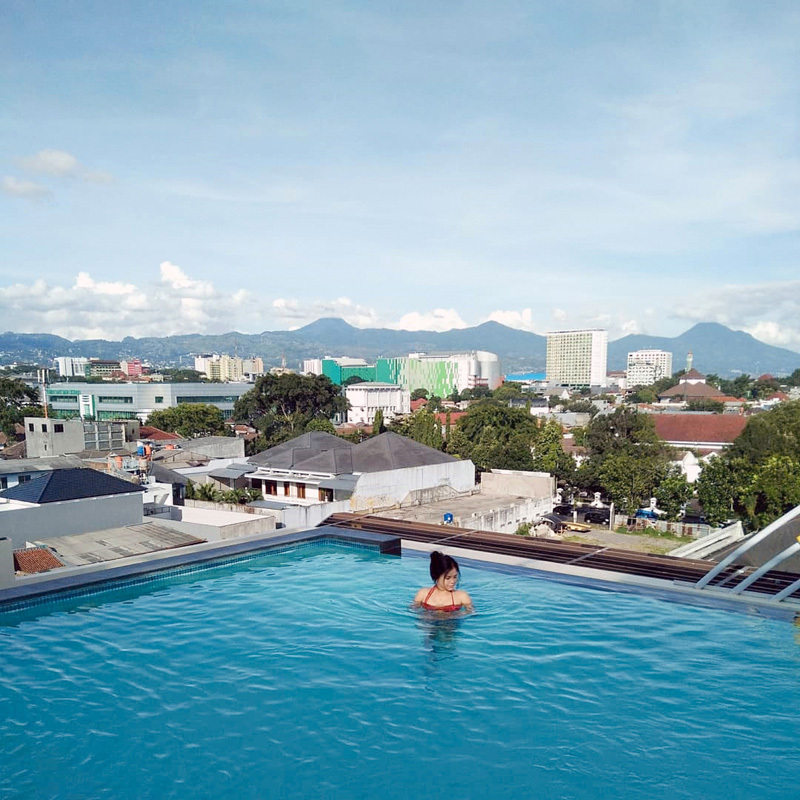 The hotel is located within Parahyangan Residences Apartment and you’ll have access to residents’ facilities, including the dazzling infinity pool that overlooks Bandung city. 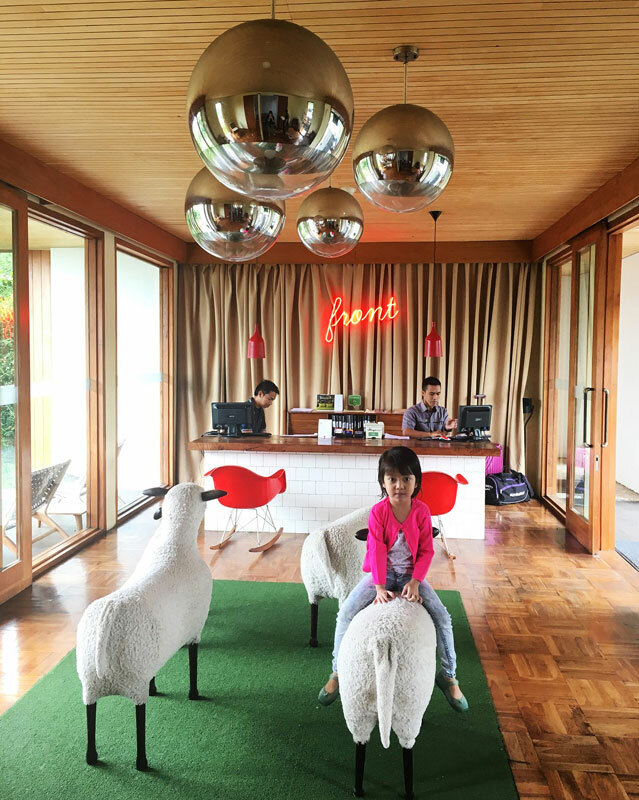 Don’t be fooled by this cozy three-storey boutique hotel. 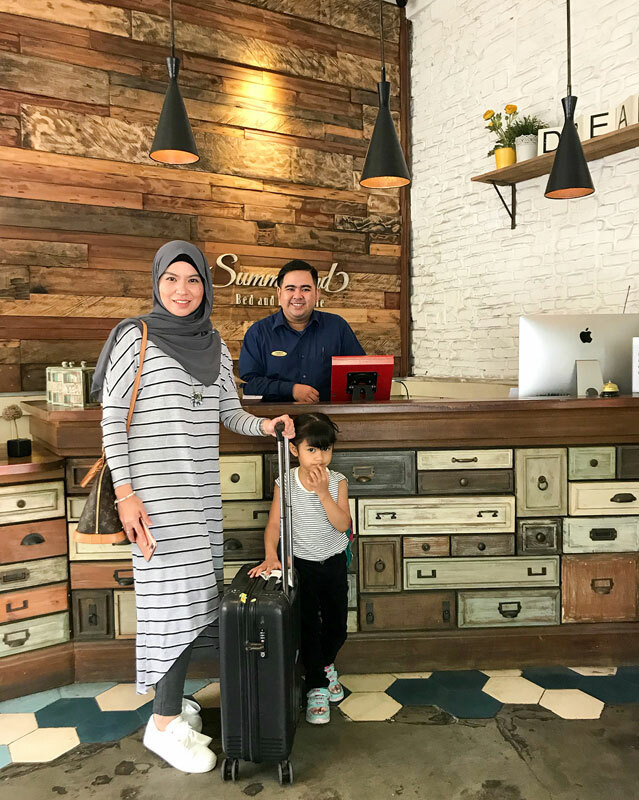 Summerbird Bed & Brasserie Hotel is an Instagrammable stay decked out in different fancy cafe themes. 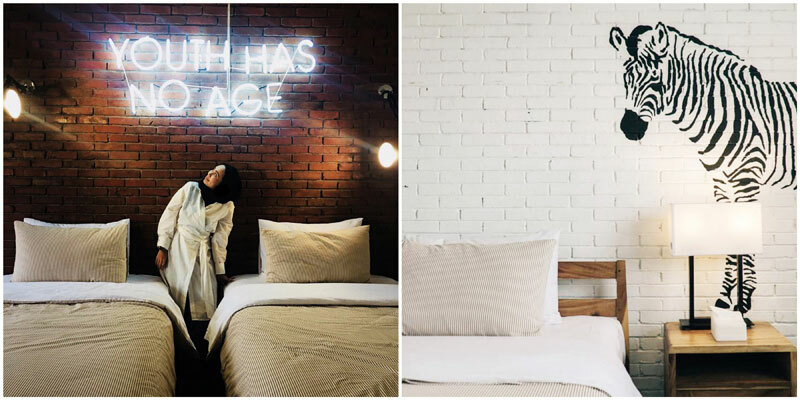 Pick your mood and flavour – be it Vintage (Chocolate), French (Tea), Industrial Rustic (Coffee) or Scandinavian (Milk), all rooms are guaranteed to be comfortable with soft fluffy bedding, furnished with modern amenities and an affordable price tag. 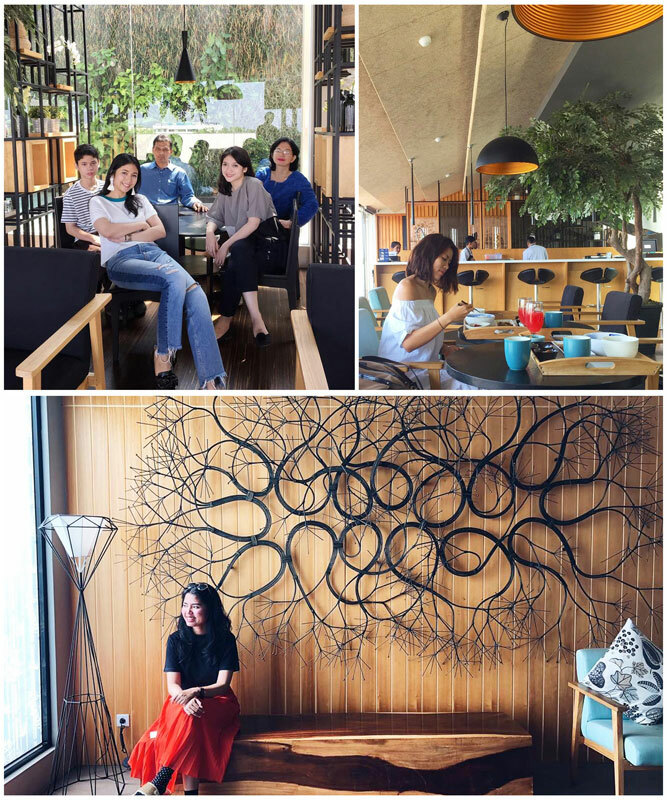 Hop over to their cafe where you can sit in equally photogenic spots all around. 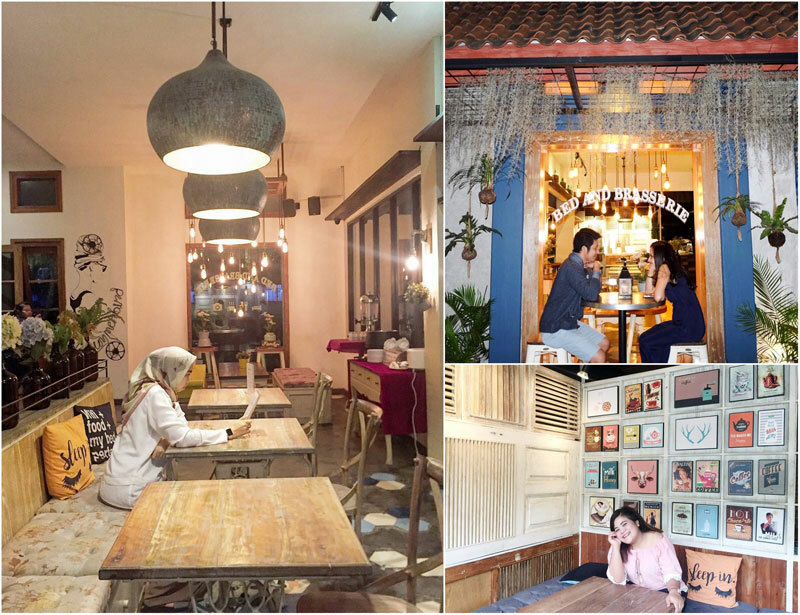 And if you’re feeling fidgety, take a stroll outside and you’ll find yourself in one of the most happening neighbourhoods in Bandung! Although Amaroossa is slightly over USD $36, but it’s too amazing to miss a mention. 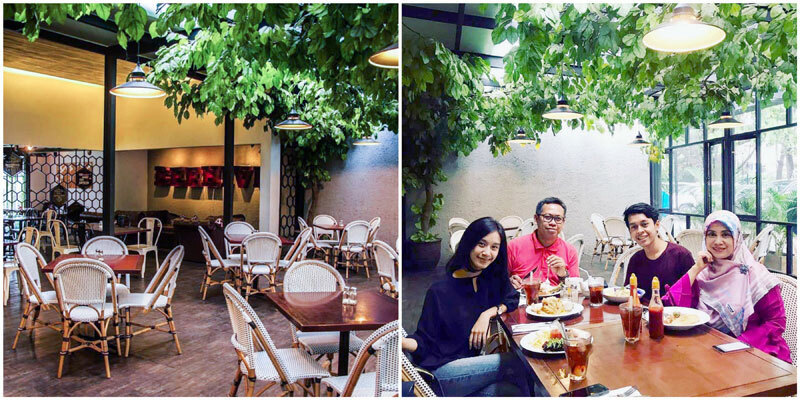 Its plush velvety interior and dim lighting is sure to make you reluctant to go outside, perfect if you’re looking to spend a romantic evening together with your beloved. 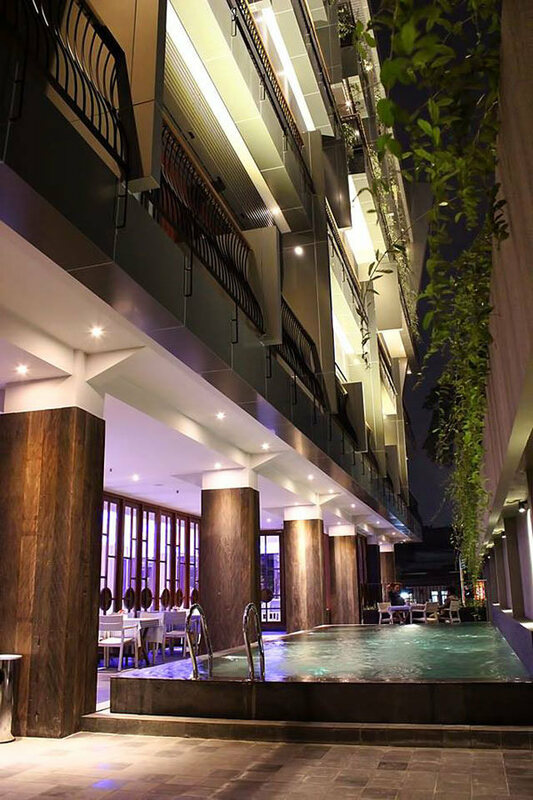 It comes with two restaurants, an exquisite swimming pool, a gym, spa, and even a games room for children! 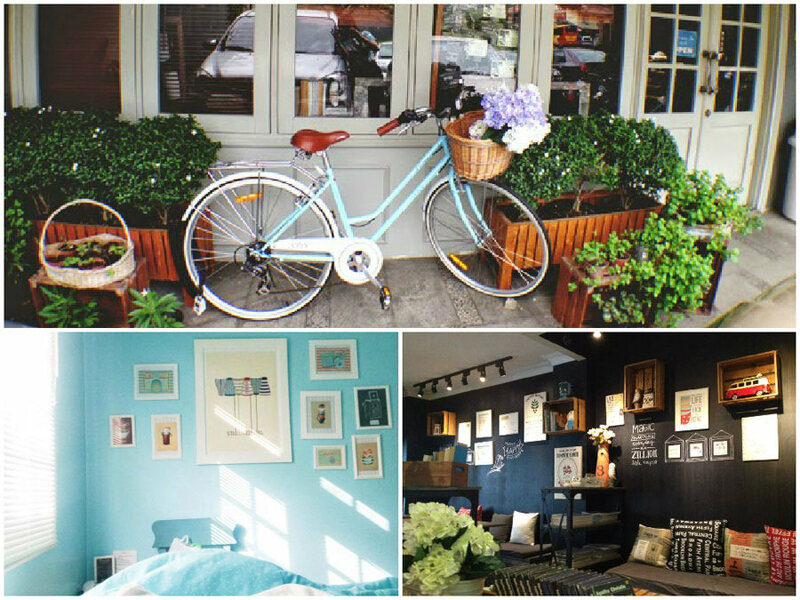 And you can also get your shopping done any time – it’s walking distance from the essential boutiques in Bandung. The Amaroossa has the biggest bang for your buck, with room rates starting from $43 a night. 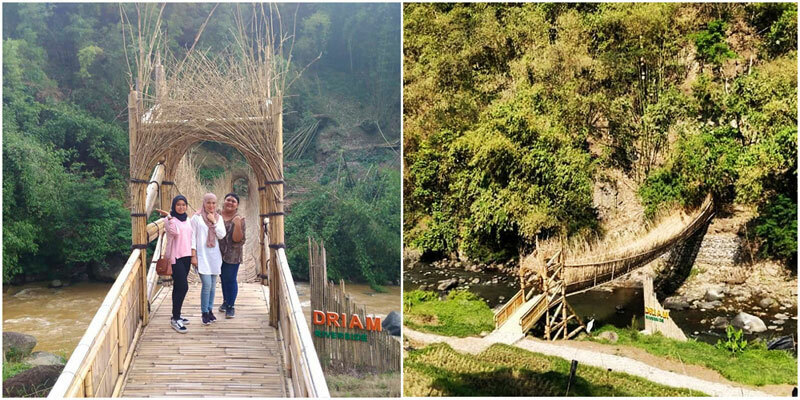 If all-bamboo infrastructures have taken over Bali, know that they’ve made their way to Bandung too! 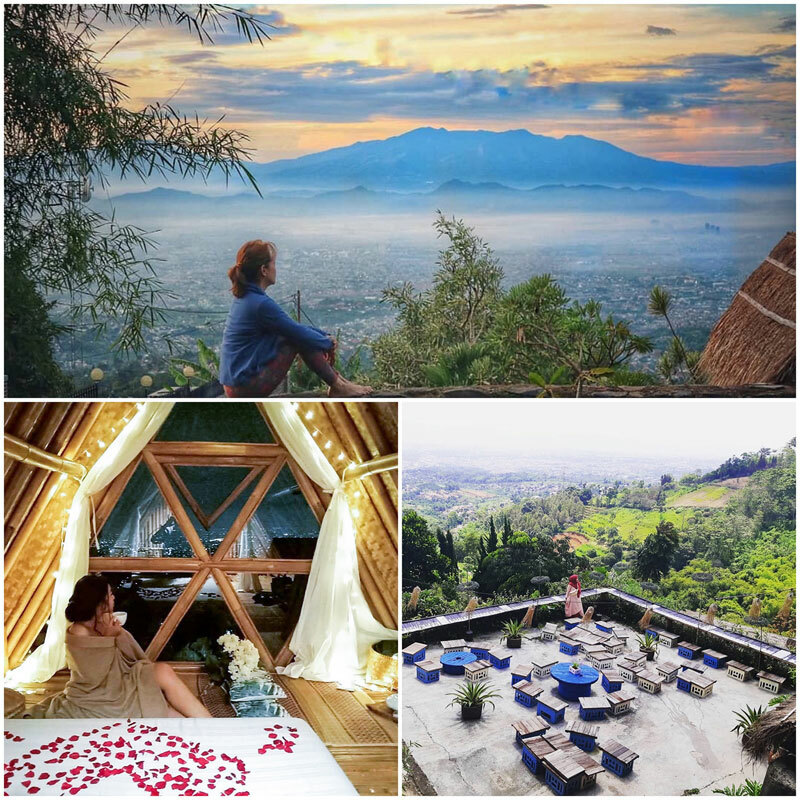 At Bukit Saung Bambu Cartil, you get to sleep in a bamboo cottage with nothing but a huge mattress, and as you start your day, relish on spectacular views of the rising sun piercing through a sea of cotton clouds. What a million dollar view! 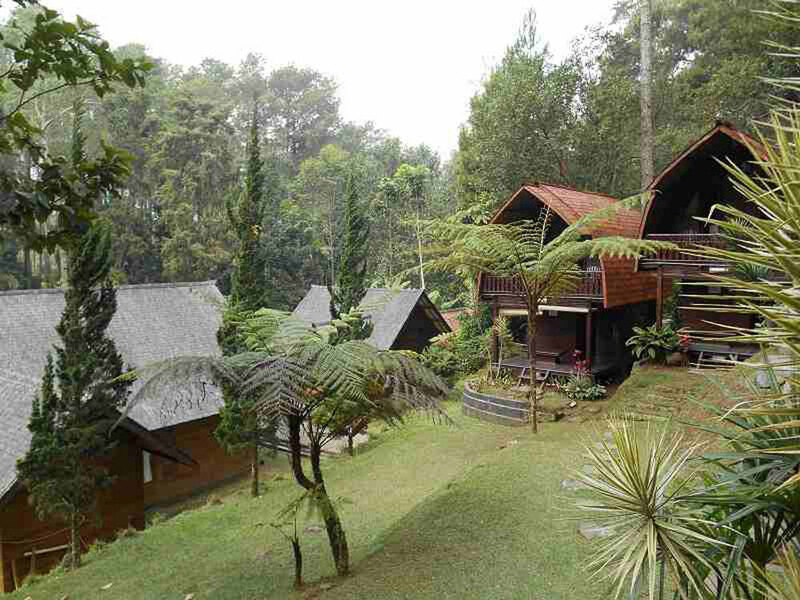 Perched in Caringin area, this villa is the perfect hiding spot from the hustle and bustle of the city; a refreshing escape from the heat too! 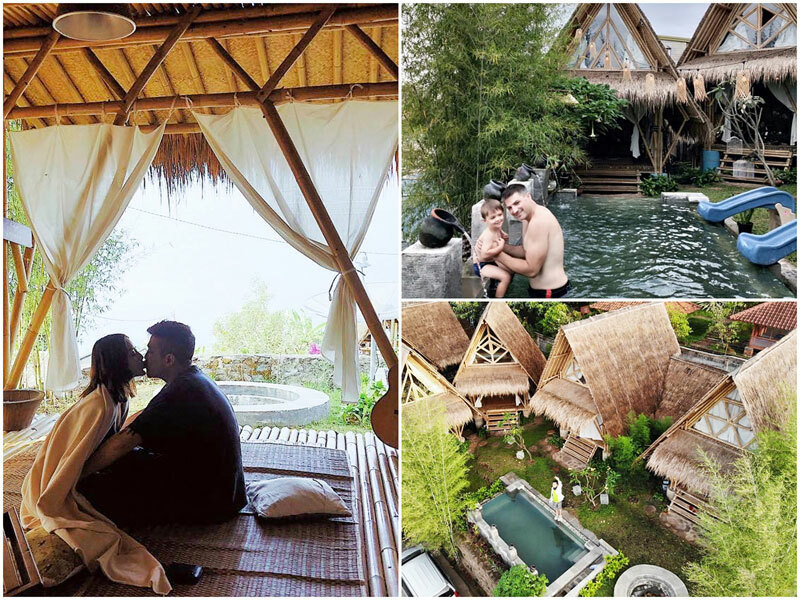 Using only bamboo and environmentally-friendly materials, you’ll find that the villa perfectly camouflages itself with the surrounding natural atmosphere. 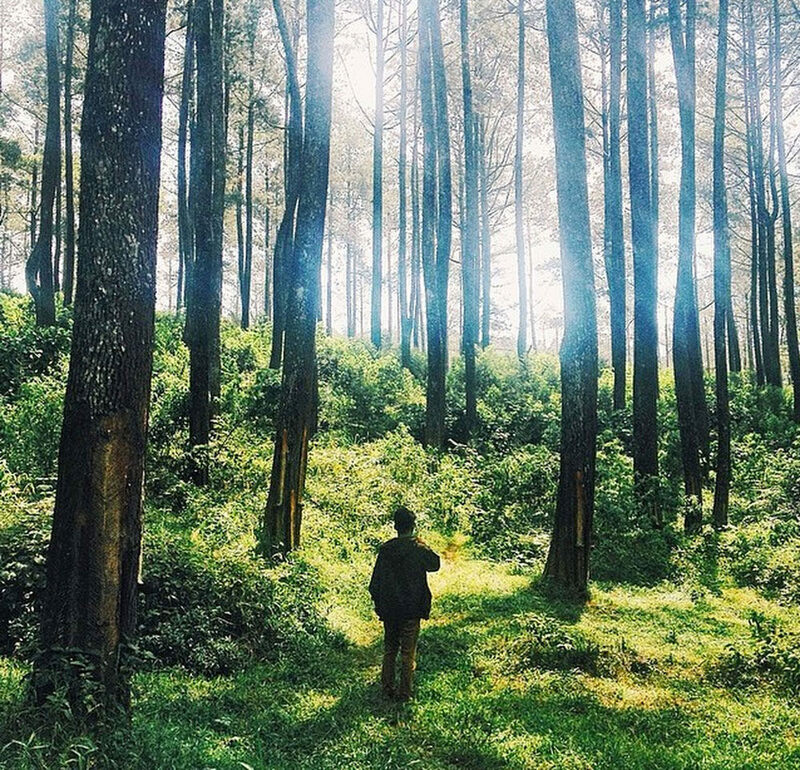 You may not find luxurious facilities here but the views of lush greenery and city of Bandung are priceless and will make up for it. 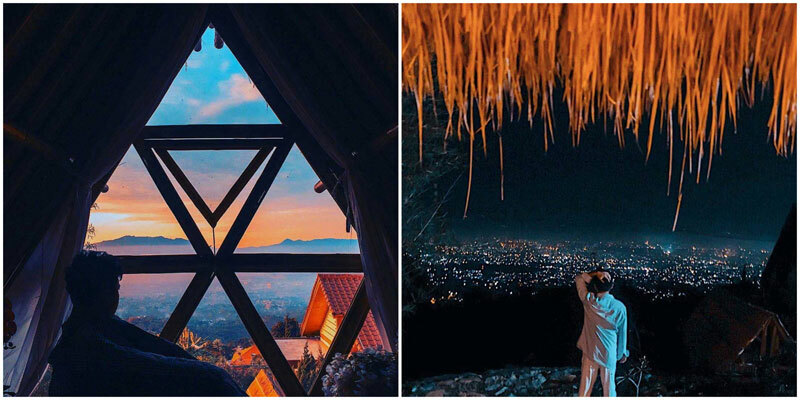 What is certain is that you’ll love spending the night in here because after the sun has set, the Bandung city will turn into a mesmerizing sea of dazzling lights, which you can enjoy right from your little cottage. 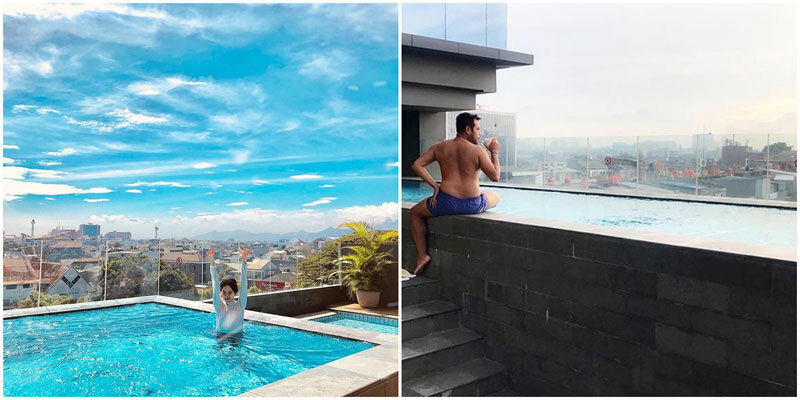 Know of other unique budget hotels in Bandung that deserve to be on this list? Share them in the comments’ section below! 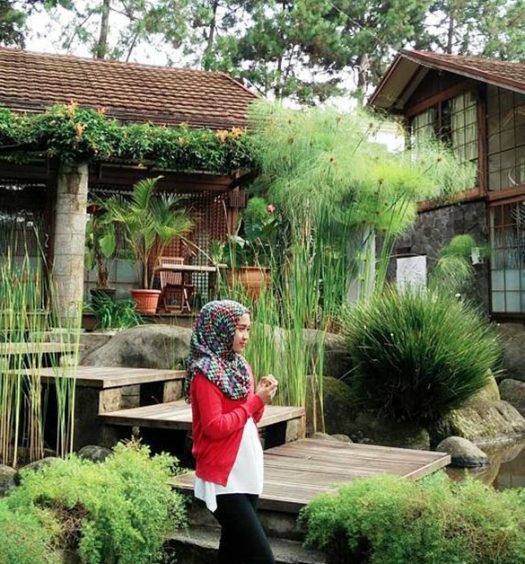 Currently studying mechanical engineering in Universitas Indonesia. Interested in traveling and music. One of my life's goals would be to cross off as many destinations as possible on my list of places to visit, becoming an engineer is how I plan to achieve that.